Welcome to the interview page! Periodically I add a new interview with a real size cowgirl. This page is about inspiration & finding out that you’re not alone when it comes to the mental & physical struggles that we have. It took a lot for these women to do an interview, and every single one of these women are absolutely beautiful on the inside and outside, and they’re more than capable of following that dream! My goal is that they will see how phenomenal they really are and that the rest of the world will too! Hi! My name is Deborah A. Fogg I live In Bergen NY.I grew up in Central NY. 20 south of Morrisville College. Which is a big Agricultural and Equine College. I have been married for 35 years and we have 2 grown sons. 29 and 33. We just became Grandparents for the first time on October 4th. My husband does not share the same interest in animals as I do. He tolerates them but keeps me grounded as I seriously would probably have upwards of 20 or more. My one Grandfather who passed away when my Mom was 18 was known for his Menagerie of animals on his farm. My other Grandfather had sheep and 2 ponies named Peewee and Maude. They were not rideable per say, however I could sit on them and my Dad would lead me around the barnyard. My love for animals especially horses seemed to be in me before I can even remember. I was given my first pony when I was 7. My barn was 60X120 and was an old dairy barn. My father built up the manger for hay and sectioned half of it off for the horses, ponies, sheep, cow, goats that we had. We also had chickens and pigs. The pasture was 30 acres and we owned an additional 125 acres. We always did our own hay. I started working at Brockport High School in September of 1990. I was in the Kitchen during serving time which was 2 and a half hours a day. In 1997 I took the position of Hall Monitor. We are now classified as Security. I work 40 + hours a week 7-330 Monday –Friday and any other sporting events when needed. How many horses do you own and tell us what a typical day is like. I currently own only 3 horses. 2 are rideable one is a rescue not yet broke. A typical day for me starts at 530am. I get up feed the dogs and cat then let them out. I then head to the barn to do the horses. I come in head for the shower get dressed and am out the door by 630. My job requires to spend my day walking around All 3 floors at Brockport High School and Monitor to make sure everyone is where they are supposed to be and not skipping class or causing problems in the halls and bathrooms or locker rooms. We have outside Security that keeps the area secure and also we have over 250 cameras between the inside and outside of the building. Tell us about your riding time. I try to ride 2-3 days a week. I do Trail Riding, Parades, Fun Shows Local Barrel racing Events and also Pony rides at Festivals and private birthday parties. I have always believed a horse should be able to do whatever is put in front of them. Therefore I try to expose my horses to as many different activities as possible. I do not work out at a gym or spa. I spend my day walking. I deal everyday with the DRAMA of what the social media world has to offer. There is always a lot of he said she said stuff going on. At the end of a long draining day my escape and coping skills are my animals. Especially my horses. To me there is no greater therapy in the world for the human soul that that of an animal, especially a horse. They are such huge powerful magnificent creatures yet are very fragile and can colic in a heartbeat and die. Do you feel like you’re strong? I do not eat any specific healthy way. I am ALWAYS what people say to me grazing as I walk the halls. I personally do not feel like I am strong but people tell me I am. I carry the weight of the world on my shoulders and am very passionate in everything I do. I give it my all which isn’t good because there are not a lot of people that do so I get upset and frustrated very easily. Which make me feel like I am weak. What do you consider your biggest achievement with horses? My biggest achievement with horses I feel would be taking the one that was labeled no good and showing the world that yes with a little love and patience they can be turned into a loving caring creature. As in everything else in the world not everyone or everything can be saved. Everything living deserves the chance though to shine. I have been dubbed on numerous occasions the keeper of island of misfit kids by teachers. I gravitate to the underdog the one that has been labeled. There is no greater feeling than helping both human and animal to bring out their fullest potential. Who would you consider your biggest influences when it comes to horses? My biggest influence I guess you could say would be Buck Brannaman. What he does for both human and animal is amazing I would love to be able to have that same affect. I mean I feel I do to a point would love to do it as a full time career/job. I volunteered for 2 years at a Hippotherapy facility. Watching the body language of a person when they interact with the horse is to me priceless and no greater reward. We also took the Horse’s to the Rochester Psychiatric Hospital for a day. I have taken them to nursing homes, School and Brockport College hosts Campabilities every year for the hearing and visually impaired children. We take the horses to that too. Tell us what you do with your horses and some of the challenges and joys you have. I have not competed in Barrel Racing since 2014. I just do fun shows and other activities. I honestly do not feel I have any challenges when it comes to riding. That is when I feel most confident about life when I am on a horse. It enables me to decompress after a busy stressful day. When I went and saw the movie Flicka, the one with Tim McGraw I started feeling very emotional as I saw that movie as my life style when I was growing up. I was not a fan of school. In fact I hated it. Every chance I got in my teenage years to skip and head to the barn I did. How Ironic that I now work at a place I despised the most. I do love my job and all the students. I have also been dubbed the Mother Hen of BHS. LOL I now have 2nd generation kids coming through. What would you change about the horse industry? I would change what the humans have done to cause all the pain for the horses. PMU Mares, Nurse Mares for race horses backyard breeders all the bad negative stuff that we as humans because of greed and other stuff have created. My goal would to someday open a facility for young and old and use animals especially horse’s as the Therapist. Something like Hippotherapy but a little more relaxed as that is done with a Speech Occupational and Physical Therapist. If I could tell the horse world something important it would be all horses deserve a chance to become something. A little love and caring and compassion goes a long way. Tell us something about yourself that you want the world to know. About myself it would be that I always keep the Faith that everything works out in the end. Even if that means spending the time to peel back all the layers. I do know what I am talking about when I say things. Give me a chance as well to prove that to whoever crosses my path. Hey y’all! I am Tracy Gunnels. I am 52 years old. I was born and raised in Georgia and have been here all my life. I have been riding my whole life. I have always said I rode before I walked, but recently I learned that I rode before I was born. 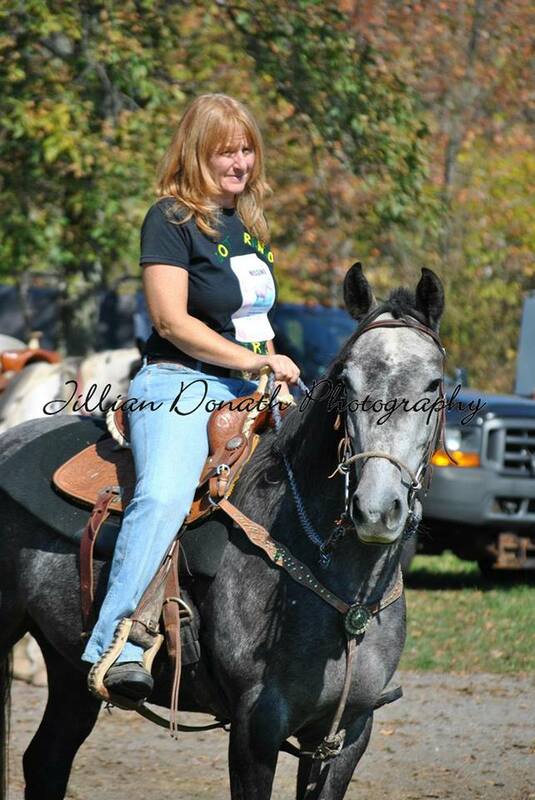 My Mom, who is not a rider at all, she actually rode some when she was pregnant with me. What type of work do you do for a living? I am an entrepreneur! I love having a home–based business so I can work from wherever I want. I have signed customers and distributors from the back of my horse. My main business is It Works! It Works! Is a direct selling company that offers professional quality beauty and wellness products, best known for “That Crazy Wrap Thing aka skinny wraps. We just launched Keto Coffee, the first in a line of new products to support the keto lifestyle. I’m really excited about this, because interest in keto has quadrupled over the past year. I have been with IWG since 2012 and I am a Triple Diamond. Thanks to It Works, I have finally been able to afford my own horse again, my first since the early 90’s. I buy, sell, and trade tack and other horse related items such as jewelry through my store, Tracy’s Cowgirl Shop. I make lava rock essential oil diffuser bracelets. My bracelets are horse and/or southwest themed. I am a rep for Karatbars. Karatbars is an amazing opportunity that makes buying gold affordable AND offers an exciting way to earn a substantial income by sharing this program. I am a rep for Aculife/Lifewave. The AcuLife Patch technology provides pain relief & calming. Improving the overall quality of life for you & your horse! Pain Management in a Patch! I just accepted a part time/flexible position as an Assisted Sales Rep with CLA to perform merchandising in stores such as Tractor Supply and Pet Smart. We represent Purina, Hill’s, Nestle, Bayer, etc. I also have a couple blog sites. 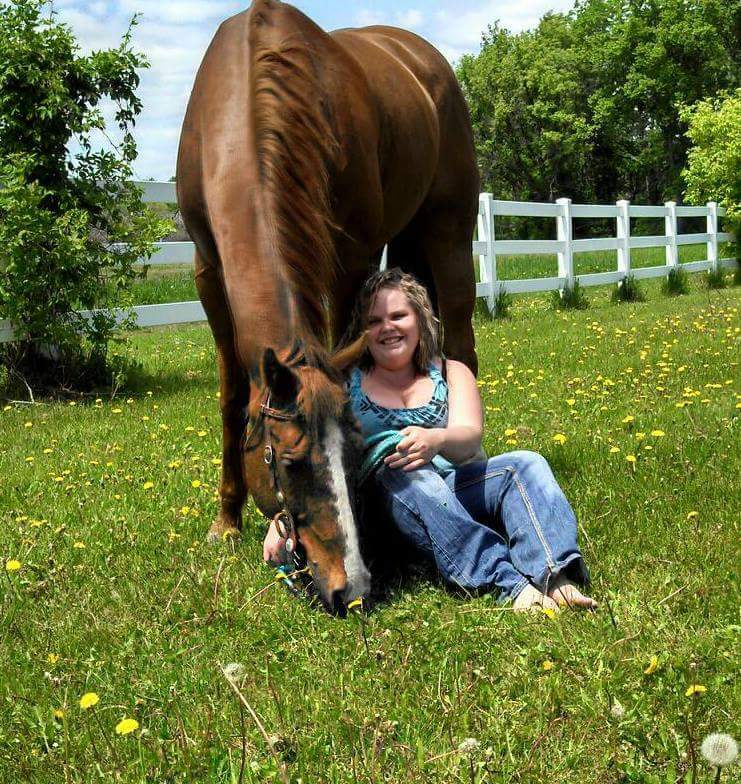 As of March 19, 2015 I became the proud owner of my heart horse… Sansational CD aka ChicaD. She is the horse I always wanted. She is AQHA and the granddaughter of Mr. San Peppy on the top side and CD Olena on the bottom side. She is cow bred top to bottom. This is the day I brought her home. How many do you ride? I have ridden a lot of different horses in my life. 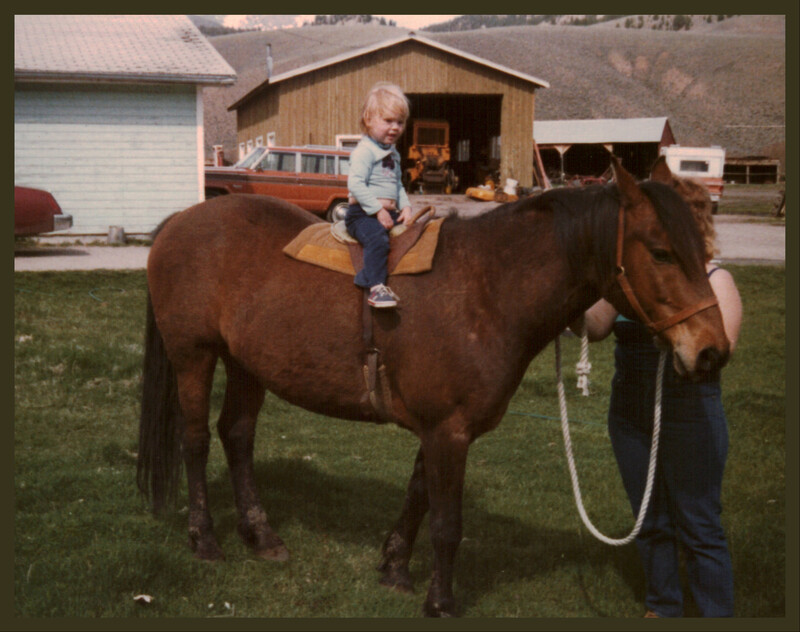 My Dad bought and sold horses while I was growing up. Then, when I no longer owned my own horse, I rode a lot of friends’ horses through the years. Now that I have Chica, I pretty much only ride her. The first thing I do every morning is get a cup of coffee and ride my exercise bike 20-60 minutes, usually 60 time permitting. Three days a week, I also do strength training. I work my business making social media posts, responding to messages, etc. until time to head to the barn. After riding, I do some more work… meeting potential clients, merchandising, making jewelry, getting ready for events, etc. How many hours a week do you ride? I’m fortunate to be able to ride Chica 3-5 days per week. I usually spend 30-60 minutes in the saddle. What is your riding schedule like? During hot weather, we ride in the mornings and cooler weather we ride in the afternoons. Do you spend most of your time conditioning, training, recreational riding? Chica has been injured and/or sick off and on for the past 2 years. She fell in April 2015 and got banged up. It took me most of that year to get her over that. We walked hills for months but by March 2016 she was finally feeling pretty good. Then, as her bodyworker says, “It gets dark at night.” Somehow, she injured herself again in April 2016. In May she was stung multiple times by God only knows what, which led to ulcers by June. It took from June to December to get her belly healed up. I spent from January 2017 – August 2017 to get her riding good again. I have spent the better part of those 2 years rehabbing her. If I have made one pass up and down the long side of the arena, first at a walk and then a trot, I have make 1000. In the beginning, we could only ride on a flat surface and the arena was the only flat spot available. Now we are walking hills most days rebuilding that hind end again. I don’t really enjoy trail riding a lot. I just don’t trust other people and the unknown. Since she has been injured I’m also scared of getting her hurt out on the trail. Fun to us is playing with the cows. Chica loves to work cows. She is a cutter reject but has cow in her blood! They can’t all make the futurity! I have been putting a good bit of time in again just tuning her back up and getting her soft and flexible again. While dealing with ulcers she became really stiff, didn’t want to bend, nor stop, nor back. Her entire body felt like a horse that is cold back. Luckily for me, she is really sweet, so she never offered to buck or be ugly. I also like to spend at least one day a week just giving her a spa day and some extra loving instead of always riding her. Although, I actually think she is happier when she does get ridden some. Do you do any type of workouts or physical activity to stay fit? I got in the habit of getting up 2 hours early every morning before work when I was a Senior Brand Ambassador for Skoal and Copenhagen. I would work out an hour and work on my business for an hour every morning but heading out to work events. Now, I ride my bike for 20-60 minutes while drinking coffee. Three days per week I do 30 minutes of strength training. At the moment, I am enjoying working out at home. I have spent a lot of hours in the gym too, which I do enjoy, but, at this time, I’m working out at home with dumbbells. I am an early riser so getting up early is no problem for me. Staying awake at night to watch TV, now, that’s a different story! Do you eat any special way to stay healthy & does your riding motivate you to do that or are there other reasons as well? I would love to say, yes, I eat a special way all the time to stay healthy, but unfortunately, I don’t keep it up. I have been studying about keto, which is high fat, moderate protein, and very low carb. I would love to stick to this. I have tried it a couple times and I let life get in the way. Riding does motivate me to work out and I would love to lose a few pounds just to be lighter on Chica and to be more agile in the saddle. I do feel like I am strong. Heck, I’ve been lifting 50 lb. feed bags my whole life! What are your biggest achievements with horses? My biggest achievement has to be just getting my horse back. There was a time when I truly thought I’d never get her back and I was going to have to make a decision of whether to just keep her and love on her or sell her for a brood mare. She is only 8 years old. I was not ready to retire her! I have spent so much time massaging her, performing red light therapy, patching her, having bodywork and chiro work performed on her, stretching, walking, walking, flexing, flexing. It’s very satisfying to have her feeling good again. Who is your biggest influence when it comes to horses? From the beginning, it has been my Dad. I never really had formal training, but I had him to help me and guide me. Through the years, I have learned from a lot of different people. I take what I like from them. For instance, I like Clinton Anderson, but not everything. 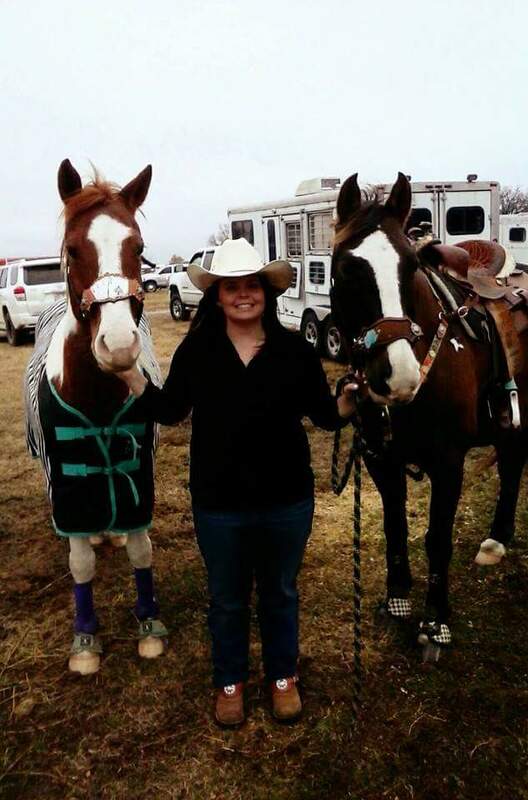 Chica’s bodyworker, her husband, and their roping buddy has been a huge help to us through her heeling and rehab. There again, I don’t do everything exactly like they do. I take what I like about their bridle work and add it to what I like about the way I already ride. I have certainly learned what works for one horse may not work that well for another horse. Last week we went to the farm that belongs to Chica’s breeder and rode with the girl I purchased her from. 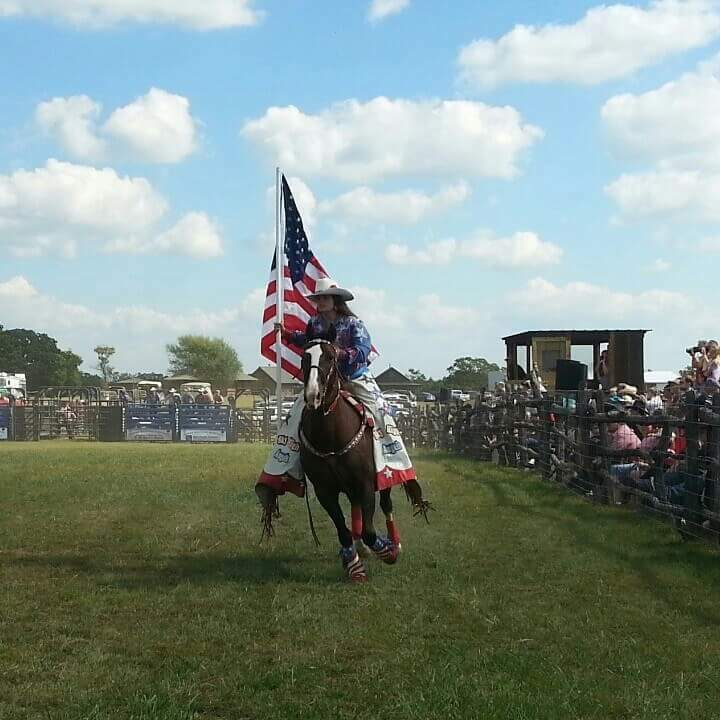 She trains and shows cutting horses so we worked the flag and did some turning back for her. It was fun and this is what we plan to do mostly for a while. Do you compete? Explain why you do or don’t. I have competed in everything from halter, pleasure, speed events, team penning, sorting, dressage, eventing, and hunter jumper. But… Chica got hurt and the association local to me shut down. I have no desire to travel across the country to compete. Some people are driving 5-8 hours to show now. That’s just not for me. The other thing is that I have learned that most people competing now are leaving their horses with a trainer anywhere from 1 week to 3 months to prepare for these shows and that’s just not for me. Now, if I compete it will probably just be at local sortings for fun. Doing what we love… This was at a cow working clinic. What are your biggest challenges when it comes to riding? Probably my biggest challenge now is trusting me. I wish I could go back to riding fearlessly like a did as a kid. What seems to help you the most when it comes to riding? The thing that helps me most when it comes to my riding, is to just block off my thoughts and go with what my horse and my instincts say to do. Sometimes I let the things I’ve read about get in the way of my riding. If you could change one thing about the horse industry what would it be? If I could change one thing about the horse industry it would be to not push these young horses so fast. Let their bodies develop and strengthen up before putting them into such rigorous training. I say so many horses with work related injuries and overuse injuries. What are your life & riding goals? My riding goals are to keep on striving to be the best rider that I can be physically and mentally and to keep on making my horse the best that she can be. I hope to be able to get her to the cow pen at least once a month. I want to keep developing the bond and partnership that we have been building. Our bond is probably stronger because of her injuries and sickness. I have learned so much about listening to her and feeling her movements. I knew my horse had problems when no professionally could see it or feel it. If you could tell the horse world something important, what would it be? Trust your instincts! Have patience! Listen to your horse. If your horse won’t, maybe he can’t! So many times, I don’t think your horse has a riding problem, he may have a physical issue preventing him from performing. Keep pushing and asking questions. Because Chica was fat, slick, shiny, and had dapples no one believed she had ulcers but me. I was right, they were wrong. If you could tell the world something about yourself that you think goes un-noticed what would it be? I am a pretty open book so I’m pretty much what you see is what you get! I am not and never will be political correct. I think that is a lot what is wrong with this country today. Born and raised in Montana and now Montana is my home forever more, but I have lived in WA, WY, DE, KY and ID. I started riding before I could walk; I was on horseback with my mom on the ranch. 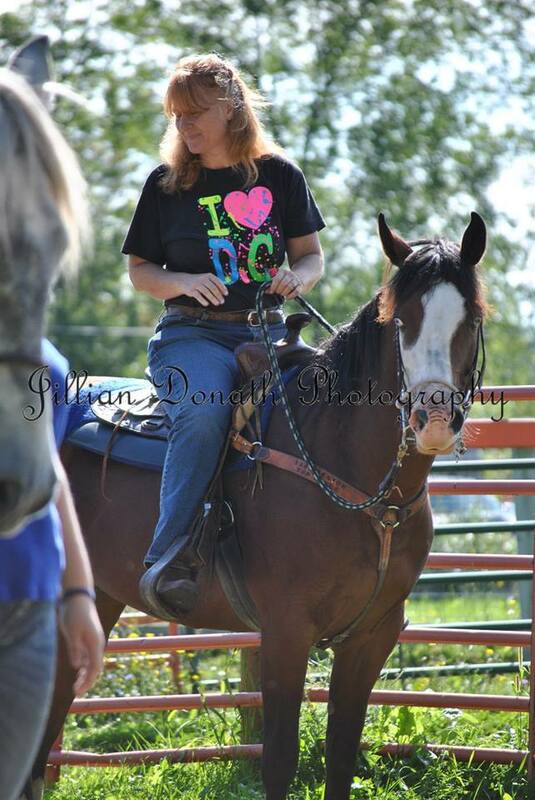 Riding was a necessity to get things done and I loved horses from the very beginning. When I was very little we had a bunch of 2 year olds on the ranch, mom came out to find me sitting on the fence with my little pink purse strap around one of the wilder 2 year old’s necks. I didn’t see the problem! Any time I could and even when I wasn’t supposed to be I was on a horse. I would get up early in the morning and irrigate with my dad. We had to cross the Big Hole River to where he was irrigating and the best route at the time was horseback, I would hold his horse while he moved the irrigation dams. I was my dad’s right hand man when it came do doing anything with the cows on horseback. I was very involved in 4-H and FFA. I studied equine management at the College of Southern Idaho and during that time was one of 15 nationwide selected for the KEMI (Kentucky Equine Management Internship) where I spent 3 months on Claiborne Farm where Secretariat stood at stud. My husband and I spent May-November running my dad’s cattle on our summer range, which involved riding together every day the first summer after we were married. Horses were always in my life, even when my husband re-enlisted in the Air Force we still had horses on the ranch to come home to. I can never imagine life without horses. My sisters and I all on Thumbtack. May 1985. Right now my most important and time consuming job is being a mom of three kiddos ages 14, 12 and 9. I am also a graphic designer, fabric designer, seamstress and Beachbody health and fitness coach. At the moment Beachbody is what I am doing the most of, I just started coaching a couple of months ago and love helping other people on their health and fitness journeys and hearing how my own personal journey has inspired people. Our middle child is on the Autism spectrum so being home allows me to keep tabs on him at school and rescue him when days get too tough. My other “hats” fill in where I can fit them. I love fabric and design and sewing, but they haven’t given me the financial freedom I am finding with Beachbody. 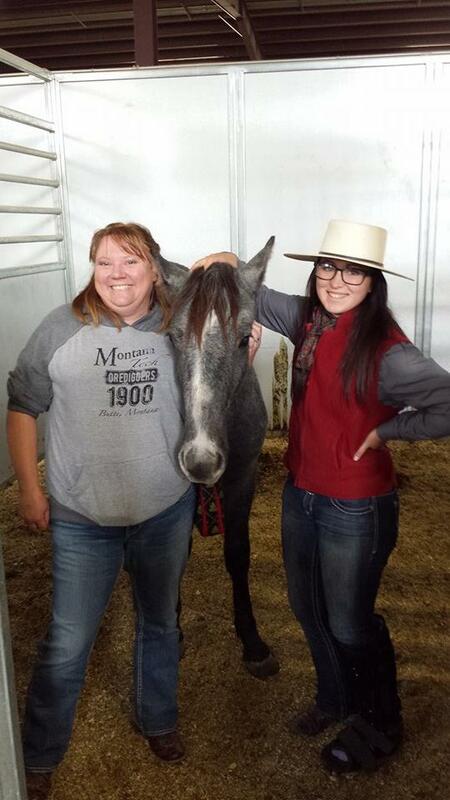 Currently 2, Sneetch, who is about 9 years old and is a blue roan paint who came out of the Pryor Mountains. Samson aka Sammy is a grey curly mustang I adopted almost a year ago as a yearling from the Impact of the Horse event in Heber, UT. He is a registered BLM mustang out of the Salt Wells Creek H.M.A. This is my test ride on Sneetch as a 4 yr old with 30 days on him.I finished him, but he had a good foundation. One of the best test rides I have had. Right now, Sneetch is the only one I am riding but I am starting Sammy under the saddle now. I think he is going to be an amazing trail horse. This is right after the auction when I won Samson, with his youth trainer Korbi. Kids up and off to school and husband off to work. Next up is me time. I get my exercising done for the day, usually about 30 minutes depending on what programs I am currently doing through Beachbody and finish it off with Shakeology (a superfoods shake). Critters are next in line; we have the 2 horses, 2 dogs, 3 cats, chickens, a turkey, 3 bunnies, fish and hermit crabs. The horses are let out of their overnight corral and onto the hillside to exercise and graze. They love running through the trees as if they are “wild”. Then I head back inside to take care of my Beachbody challengers and drink a cup of bulletproof coffee (coconut oil blended with honey and coffee). Lunch, laundry, dishes, house cleaning and other projects take place and then kids get home from school about 3:45. Then its launch into homework, dinner and family time. After dinner, horses are put back in the corral and critters all are fed/watered again then its bedtime for kids. Once kids are in bed, my husband and I spend the evenings together, watching movies or TV shows or visiting about our next project for our place. Currently that includes, horse barn, tack room and hay storage plans. Honestly right now, it has been zero; we moved in June and were not able to get horses over here until a couple of weeks ago. I just haven’t taken the time to get out by myself yet but hope to do it soon. We border State land and I am looking forward to some beautiful fall trail rides, we had our first snow this morning after almost 2 weeks of crazy rain. I am hoping to put my riding in my schedule after my workout and do it daily. I will have a fair amount of groundwork with Sammy to do but will be able to pony him off of Sneetch for the time being. Once Sammy is under saddle then my daughter can ride with me when she can. My husband used to ride, but after back injuries in the Air Force it is too painful for him anymore. Now that we are no longer on the ranch, trail riding and hunting trips will be the majority of the riding I do. I love a nice relaxing trail ride in the Montana mountains! I will be spending a larger portion of my time working with Sammy and getting him ready under saddle and then he will have his work cut out for him as a trail horse. 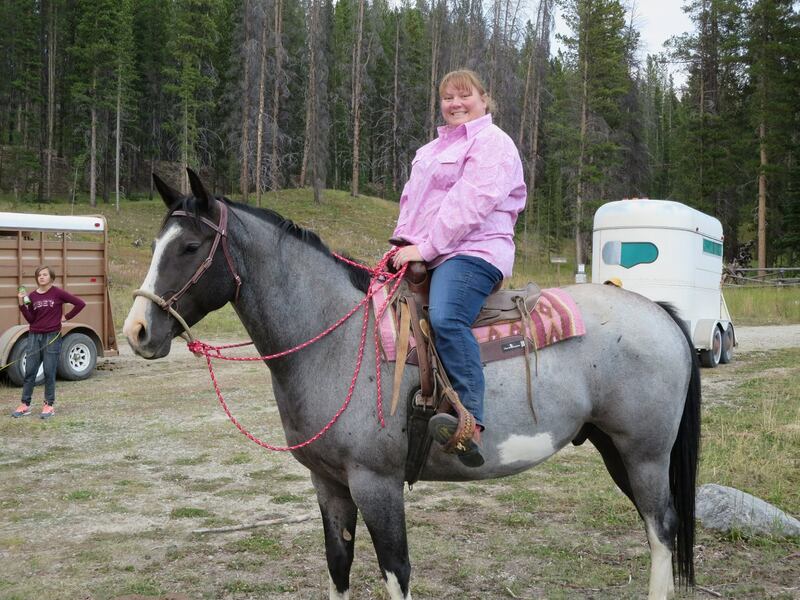 We do a lot of riding in more wild mountain areas where we hunt. I prefer training to happen on the trail and through experiences as much as I can. Working out hasn’t always been easy for me or a priority for that matter. 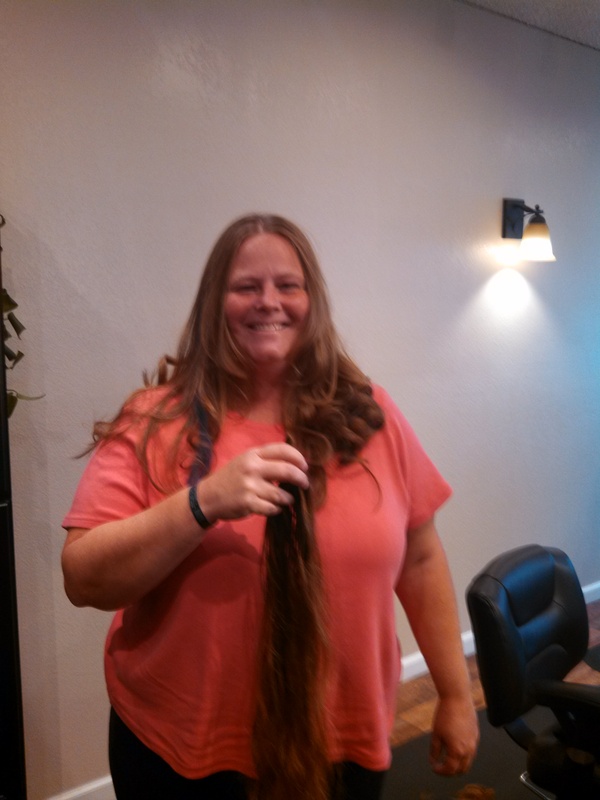 I had really let myself go and was the heaviest I have ever been and knew I needed to do something. This summer a friend of mine who is also a Beachbody coach encouraged me to try Beachbody’s 21 day fix challenge program with her and I fell in love. It was something that wasn’t super time consuming, most programs are just 30 minutes a day from your own home, no driving 1/2 hr to the gym and back again. I made progress in getting healthier right away. I have PCOS (Polycystic Ovarian Syndrome) which is an endocrine disorder and have struggled with my weight for quite a few years, the PCOS makes it very very hard to lose weight, and caused me to become pre-diabetic and insulin resistant as well. There are a lot of symptoms and other problems that go hand in hand with PCOS such as weight gain in the mid section, endometriosis, hair loss, hair growth, skin tags, sleep apnea, fatigue, mood swings, depression, anxiety, acne, ovarian cysts, infertility, high cholesterol, insulin resistance, diabetes, irregular cycles and the list continues. After one round of the 21 day fix I lost almost 15 pounds, was able to go off of my medication (with doctors permission) and was completely out of the pre-diabetic zone. I wasn’t having the highs and lows with the insulin resistance that I previously had! Plus I was getting more flexible so riding was easier. Along with the Beachbody fitness program I drink Shakeology, which is a super food shake that is high in protein, low on the glycemic index and has no artificial sweeteners or junk in it. It gives me a serious boost nutritionally! My eating now follows the 21 day fix meal plan, which is based on a balanced diet and focuses on portion control. No feeling like I am on a “diet”. This is a lifestyle change for me. I was finally able to give up soda completely and got rid of most of my junk food cravings. I always felt like my inability to get healthy was just something I had to live with due to the PCOS. Now I know that things will be different. I can’t even begin to say how excited I am that I am getting more flexible and that riding is much easier. Now I have the energy to go work with my horses, instead of staying inside wishing I “felt good enough” to ride. I don’t ever want to go back to not feeling good enough to ride and seeing my horses every day reminds me of that. I am strong! Strong physically, emotionally and mentally. But is has not always been this way. One of the things I have learned recently is that you also have to support your mental well being and one of the best ways to do that is through personal development reading. I never saw a need for it, but now that it is a part of my life I will never go back. I am back in control of my life again after years of struggling with anxiety, depression, exhaustion and having a terrible body image. Will I ever be “skinny”? Nope, its just not my body type now, but I can certainly be healthier, even without losing more weight. I have learned to love myself how I am, and at the same time striving to be healthy. Building a strong bond with a horse is the biggest achievement to me. Being able to work well together and trust each other. Just being able to “ride” a horse is not enough for me, I want the horse to trust me and to be able to trust them as well. My internship with Kemi is probably my biggest measurable achievement, it is also where I learned that the horse racing industry is not for me, especially not big commercial farms like Claiborne. At this point I don’t compete, I don’t feel I could dedicate the time and money to any kind of competition right now in my life. In high school I competed in Rodeo and Horsemanship, but have not since then. I think that mounted archery is a fascinating up and coming competition as well as extreme trail riding competitions. Maybe one day I will compete again. The biggest challenge for me right now is people looking at my size and judging what they think I know about horses. I get frustrated when people talk to me like I am a fat lady who has “pet” horses and don’t know what I am talking about. I find the horse world to be one of the most judging communities out there, and sometimes it is hard to be a part of that. I don’t know what makes everything different with horse people but I do know that it can be discouraging at times. I am learning to be remain confident in my ability despite my size. Feeling free! I can just let my mind go, probably the closest thing to meditating that I can reach. I can enjoy the quiet moments without ever feeling alone. The feeling of the horses warmth, breathing, heartbeat, movement and smell has a great calming effect for me. Rescue a horse as you would rescue a cat or a dog from a shelter. There are beautiful Mustangs out there waiting for homes, most of which haven’t learned bad habits from being raised in a situation that focus’s on being the horses friend instead of its leader. There are programs out there to help people adopt mustangs that are suitable to their needs and don’t require you to tame one from “wild”. The BLM T.I.P. program is fantastic, as well as the mustang makeovers and competitions. Samson was a youth competitors’s yearling that was then auctioned at the end of the event, in the Impact of the Horse Event in Utah. He had a super great start! And if you are not willing to rescue or at the very lease stop your back yard breeding, then you better get comfortable with horse slaughter. I want to continue to live a happy healthy lifestyle and work on inspiring others to do the same. Building my beachbody coaching business and helping other women who don’t think better health is possible or that you have to give up everything to get there is important to me. 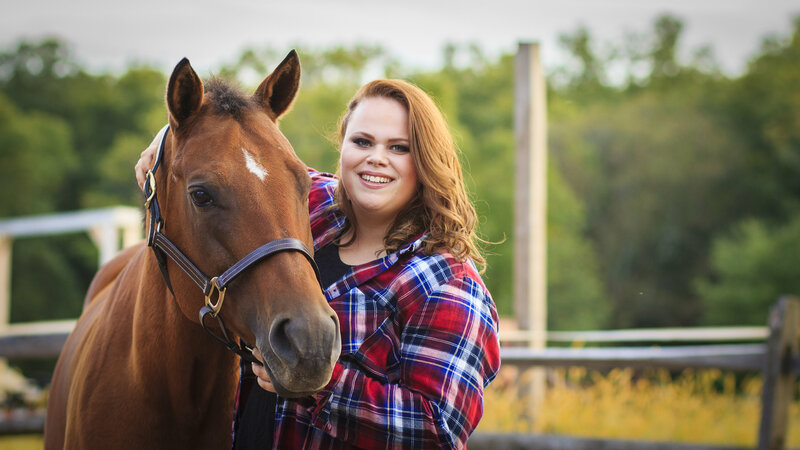 You can be a great horsewoman at any size! I want to keep working on my strength and flexibility so that I am able to keep up with my horses for many years to come. The love for a horse is not limited by size. A camping trip in the mountains and trail riding. 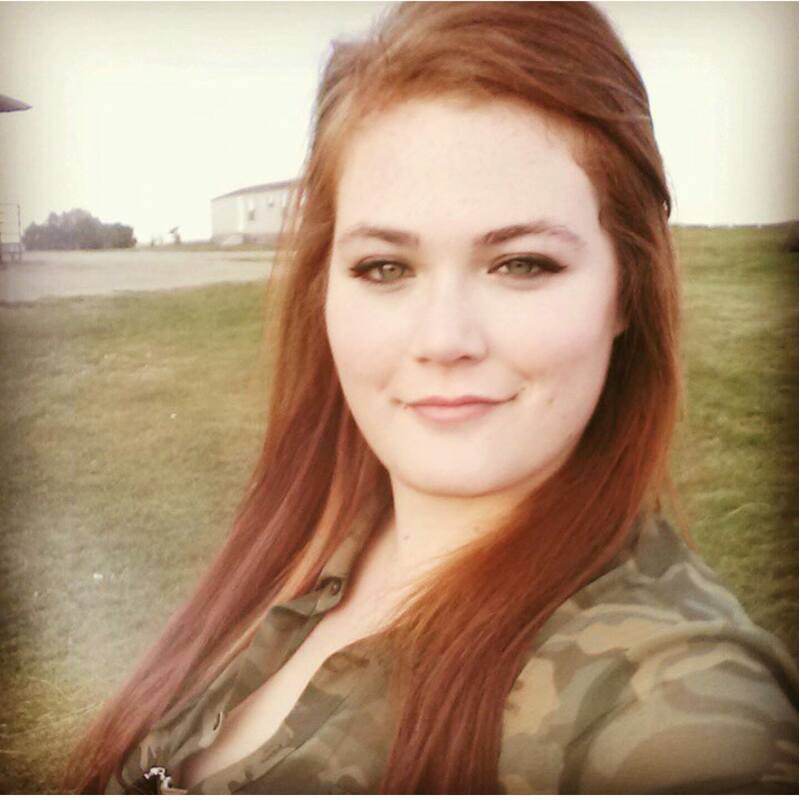 Rachel is a beautiful farm girl that I think a lot of us can relate to with the struggles that she talks about. I think you’ll enjoy reading about her. Age? State you live in? I’m 29 years old and I live in Arkansas. I’ve been obsessed with horses since I can remember. I guess you could say i was born with them in my blood. I finally got a horse of my own when I was 11 years old. Currently I manage our farm. We have 20 head of horses, chickens, & I raise show rabbits. My husband works 12 hour shifts on nights so he sleeps during the day. That leaves most of the farm chores and animal care to me. Its a 24hr, 7 day a week job but I can’t complain. I’m living the dream as far as I’m concerned. How many horses do you own? How many do you ride? I own six full size horses, a yearling mule, four miniature horses, & two miniature donkeys. My husband has two horses and my uncle owns six that are also on the farm. Im currently riding four of my six now, two barrel horses & two drill horses. I have two horses and a mule that I’m currently just doing ground work with. One is a 3 year old BLM mustang I adopted and the other two are my yearling filly & mule I’m raising. I also ride my uncles gaited horses. During the week I usually take care of the rabbits & chickens early in the morning. Then I get all the other chores done like putting out hay etc. That leaves me plenty of time to work horses in the afternoon. I also work on agility training with my dogs a few days a week. The weekends are usually pretty hectic. I have barrel races, riding club shows, and ranch sortings on most Saturdays and sometimes Fridays. I have drill practice every other Sunday and during rodeo season we will be performing on some weekends. How many hours a week do you ride? What is your riding schedule like? I usually ride at least 2-3 hours a day. 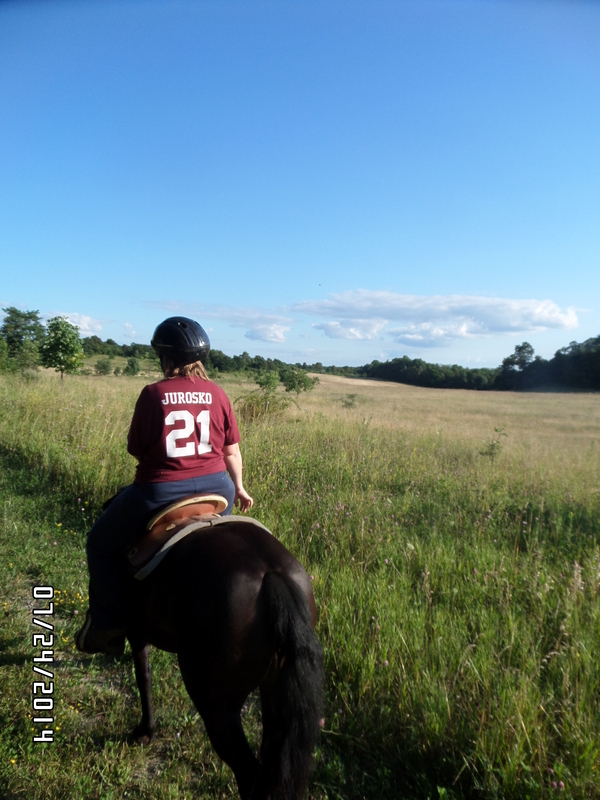 I ride on trails around the farm and I try to haul to the arena a couple of times a week. Its only about 10 minutes away so its pretty convenient. I used to do a lot of recreational riding in the mountains but I hardly ever do now. All my time is spent on conditioning or training since all my horses are either performance horses or in training. I go to the gym 3-4 times a week & I do a lot of hiking with my dogs. I used to be a runner but a old riding injury limits my running ability drastically. If I run much I start having really bad muscle spasms in my lower back. So I stick to weight training and hiking. Do you eat any special way to stay healthy & does your riding motivate you to do that, or are there other reasons as well? Well I’m lactose intolerant so I don’t eat much dairy. I try to avoid eating out as much as possible and stay away from junk food. I have a terrible weakness for Pepsi but I’ve cut back a lot. I also use a app on my phone to keep track of my calories so I can stay under a certain amount. Riding is the main thing that motivates me to be healthy and strong. It helps make me a stronger rider. I feel very strong! Riding horses has made me physically strong and given me the confidence that makes me mentally strong too. 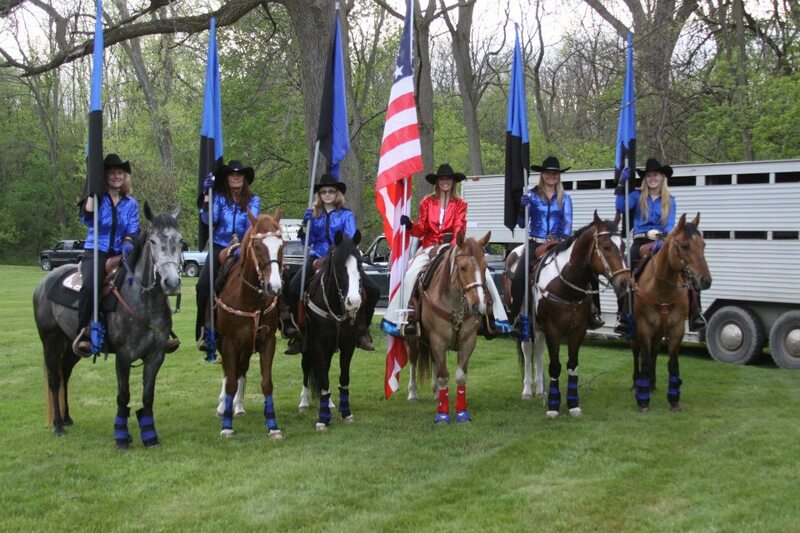 I got to perform in the movie Cowgirls N Angels with my drill team. We hauled to Louisiana to film for about two weeks. It was a great experience. 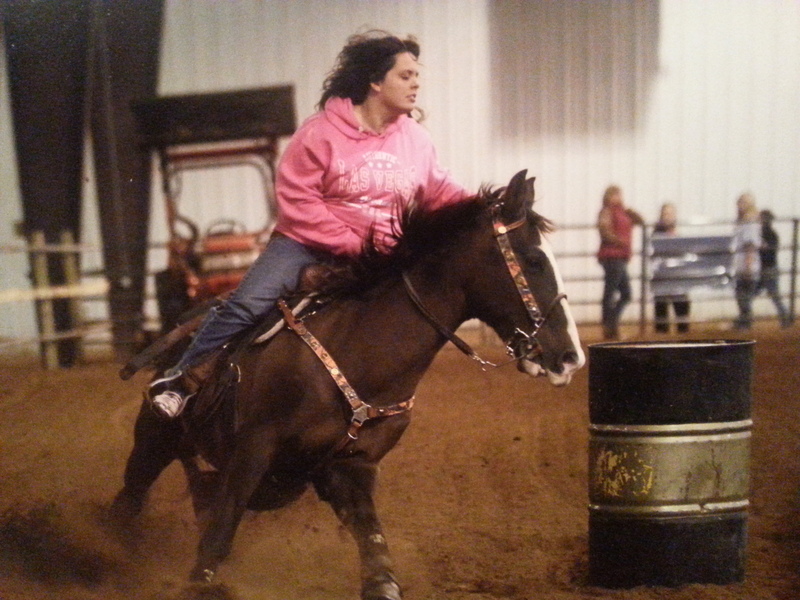 Winning my first saddle barrel racing was huge achievement for me too. 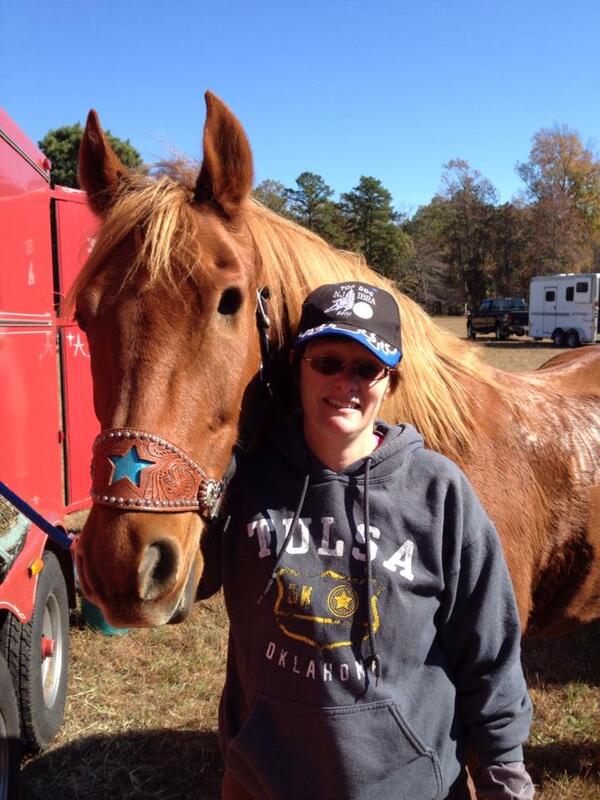 Qualifying for NBHA World Finals was also big for me. These are all things I never dreamed I’d accomplish when I started riding. I’ve done all my own training and its been hard but I’m very proud of how far I’ve come. My biggest influence would have to be my best friend Cheryle. She pushes me to be better and I’ll forever be grateful for it. We both have anxiety issues and we help each other work through it. I compete at NBHA barrel races, show at our local riding club, and I ranch sort with my husband. Its not competing but I perform on a fast paced equestrian drill team at rodeos. We’re kinda like the half time show. My biggest challenge is keeping my anxiety under control. Its hard sometimes but I refuse to give into it. My husband helps me the most with riding. He helps me get my horses ready, hauls me when he can, & he encourages me. I would change the negative stereotypes of mustang horses. My riding goals are to be a better rider and horseman in general. I want to change the negative stereotypes of mustangs by competing on my mustang Maverick. I want to show people what wonderful partners they make. I also want to do The Extreme Mustang Makeover. Don’t judge people by appearance or horses by breed. I struggle with severe anxiety on a daily basis. Its really hard sometimes but I refuse to be controlled by it. 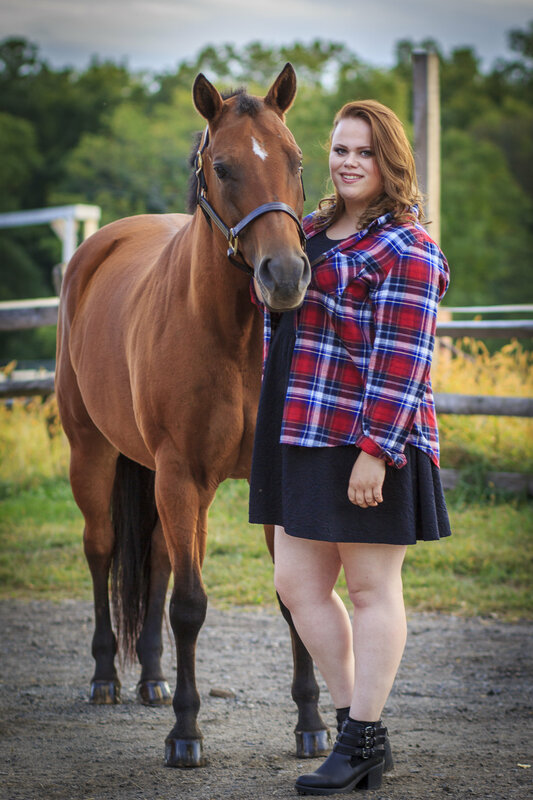 Erin is a full time college student that lives in the northeast and leases a wonderful little mare that’s blind in her left eye. Erin has a full load of classes but she rides every chance she gets! I started riding when I was 17 and I was a part of my college’s equestrian team. I wanted to ride when I was younger, but my parents never let me. I’m a full time college student at York College of PA; majoring in public relations with a minor in music industry. I only lease one horse- a quarter horse named Cassie. There are other school horses at my barn I could ride, but I need to build up my confidence first. In the summer, I usually ride 6-7 days a week. But with school starting I only ride Fri-Mon now. It’s about 4-5 hours a week. I try to do a lesson every time I ride, but sometimes I hack. Cassie is blind in her left eye, so she hates anything besides the ring. So, we do a lot of groundwork. Walk, trot, canter, and the occasional crossrails. If I could show, I would. If I had the time, I would go to the gym. But, I like to run on the track when I find a moment. I also run/ hike when I’m at home. I would say it’s like 3 hours per week, on a good week. Sometimes I just walk around campus. It depends how much energy/ time I have. I am on a low carb, no soda lifestyle. Being in college, it’s really difficult to find healthy eating options in the dining hall, so I will eat the occasional pizza or chicken nugget, with portion control. And I have learned to love water! Which is really good for losing weight. Riding motivates me A LOT to eat less and drink more water. I always think about “Cassie has to carry me around.. do you really need that sandwich?” and things like that. Probably not the most positive way of reinforcing healthy eating, but it works for me. I always make sure to at LEAST eat 2 meals a day. Not eating doesn’t do anything but tear you down. I know that I’m strong! I’ve definitely gained a lot more confidence and strength as a rider and a person since I’ve started leasing Cassie. I workout a lot more, so I gained a lot more muscle and lost a lot of fat. But confidence wise, I’m stronger than I’ve ever been. I would have to say my 2 biggest achievements with horses would have to be when I showed Lincoln (an OTTB I used to ride) and cantering on Cassie. I have horrible anxiety, so the thought of people judging me in a show ring is like a panic attack waiting to happen, but I showed Lincoln last July in a local PA show with my old barn and I earned a 4th and two 5ths. I proved to myself that I could do it, which was huge. And to most people, cantering doesn’t seem like a huge deal because it’s just a normal part of riding. But, I didn’t believe that I could do it, or had the riding ability to, so I constantly doubted myself. I doesn’t help that Lincoln bucked me off a time or two at the canter. But, I got through it with the help of my trainer, and now I’m working on trusting myself more at the canter. My biggest influence when it comes to horses would have to be my trainer, Lindsay. Lindsay actually has pushed me and encouraged me more in a very positive way than any other trainer. I learn a lot by watching her ride, too. She seems to make it look so easy. I don’t compete because I don’t like to because it makes me anxious and Cassie can’t because of her blind eye/ she doesn’t really jump. My biggest challenges when it comes to riding would be trusting myself and having confidence in my riding ability. I lack both of those, but I’m working on building myself up lesson by lesson. An understanding and patient trainer and horse helps me the most when it comes to riding. I need someone that understands what I’m feeling and can push me in a positive, and motivating way. Lindsay and Cassie help me a lot with that. If I could change one thing about the horse industry, it would be the amount of criticism and shaming that happens in and out of the show ring. It’s like.. it doesn’t matter about your riding ability and talent anymore, it becomes more about who has the most expensive made horse with the most expensive breeches and boots. That’s what I hate about the show world. I also hate the body shaming that happens in the horse industry, like everyone has to be stick thin and the plus size riders are over looked because they’re made differently. I think that’s BS. Believing in yourself and your riding ability is one of the most important parts of being an equestrian. I work really hard to lose weight and I’m plus size because of a condition I have, which makes it impossible for me to lose weight. I think sometimes people just look at the surface, and see me as a “fat” person. I probably eat less than an average person, and workout a lot. I just have chemicals in my body that prevent me from losing weight. With the daily hustle of working, taking care of families, and doing barn chores seven days a week we often forget how blessed we are to have our horses. It only takes a moment of talking to someone like Anastasia to remind us that we need to take the time to enjoy our horses every single ride. She’s a beautiful cowgirl inside and out that although she lives in the city, she’s extremely passionate about the western lifestyle. The horse industry definitely needs more ambassadors like her! I have always loved horses, but growing up in the city it was hard to make it a steady thing. I was a Girl Scout and rode every summer. My mom encouraged my love of outdoor sports by making every opportunity she could available to me. By education I am a Human Resources Professional, I stepped out of the corporate race after I had my son and didn’t want to continue to travel for work. Now I manage a store and work 48 hours a week, 2nd shift, 5 days a week. SO as you can see this is not an ideal situation, so looking to move on. How many horses do you own & how many do you ride? I try to ride on the weekends, but sometimes I ride on weekdays that I have off. I am taking equestrian lessons. So I have an hour of lessons and practice weekly. Do you spend most of your time conditioning, training,recreational riding? Lessons and in the better weather recreational riding. I have found that core strengthening and cardio are very helpful when trying to keep a large horse under control. Sometimes I’ll go to the gym after work (at midnight) to get a good workout in and to unwind from work stress. I try to make better food choices. I feel like the healthier I eat and behave the easier it is to handle everyday stress and perform better. I think I could be in a better physical place. The extreme cold we had over the winter made it easy to let some things go to the way side. Mentally I am so excited for Spring. I need sunlight and less cold weather! Making it a priority to spend time with those amazing equine athletes. Learning good horsemanship. Getting my son involved in 4H so that he has an appreciation for all that is required to care for all animals and our planet. Women breeders that are so rarely highlighted. Not yet – As a city girl I never really considered competing and then time kinda got away from me. But after watching June Holeman in The American in 2014, she showed me that you can compete at any age, you just have to put the work in! Time to put the work in. Equestrian riding is most common in this area, so finding like-minded western riders is challenging. Knowing that there are people out there who are doing the same thing I am. Finding them on social media. Being able to use Internet resources to find answers to my questions. 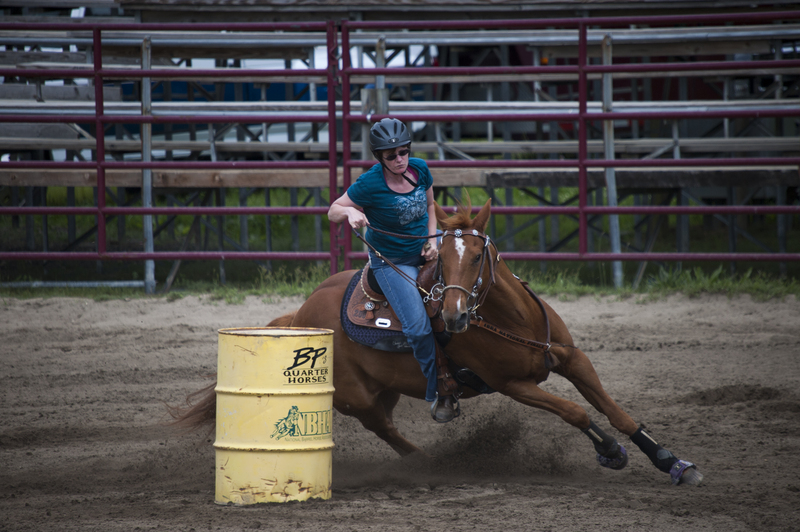 More women centered events being part of mainstream rodeo. More women taking the lead in breeding and training and getting the recognition. If I could make my biggest dream come true it would be to breed horses for barrel racing and bucking broncs, I would like to compete in a rodeo at least once in my life as a barrel racer and a team roper. So I am trying to settle on a path I can pursue and will probably leave Philadelphia in pursuit of that dream. If you could tell the horse world something important, what would it be? Reach out to city children, they are super talented but lack exposure to horses. I would love to see some of the big organizations reach out to the small local organizations that help children learn horsemanship. I am very passionate about the western lifestyle. When people ask me where I am from they get wide-eyed because I am a city girl (and of course because I am don’t look like them 🙂 ). But Pennsylvania is state full of green space. Within a 10 minute drive of my house you will find farms full of horses, cows, and lots of foods that we eat all over the country. One of my college classmates owns a farm/ranch and is raising Black Angus. Besides competing I want to hit all of the major rodeos and stocks shows. But lots of people want to do that. I really want to do cowboy Christmas and see what that is like going from place to place in such a short period. 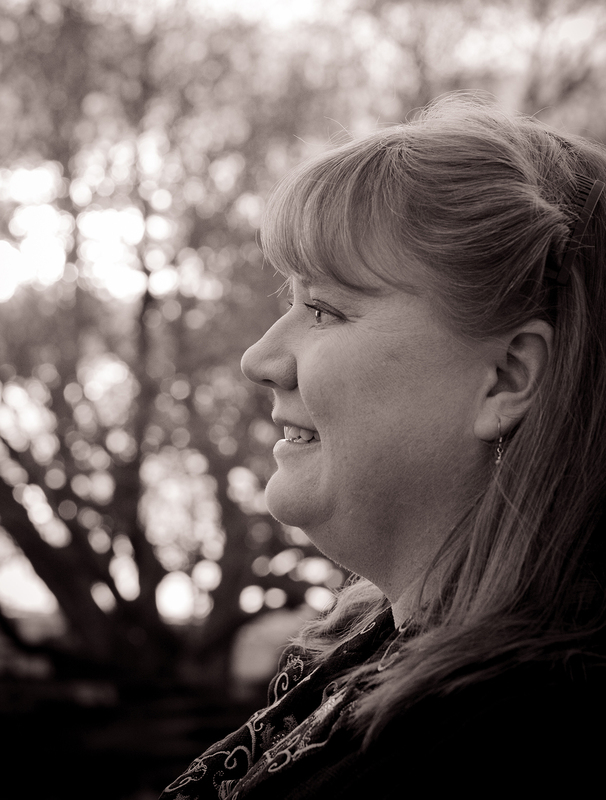 Staci is a cowgirl that is proof that you just never know what influence you will have on someone. 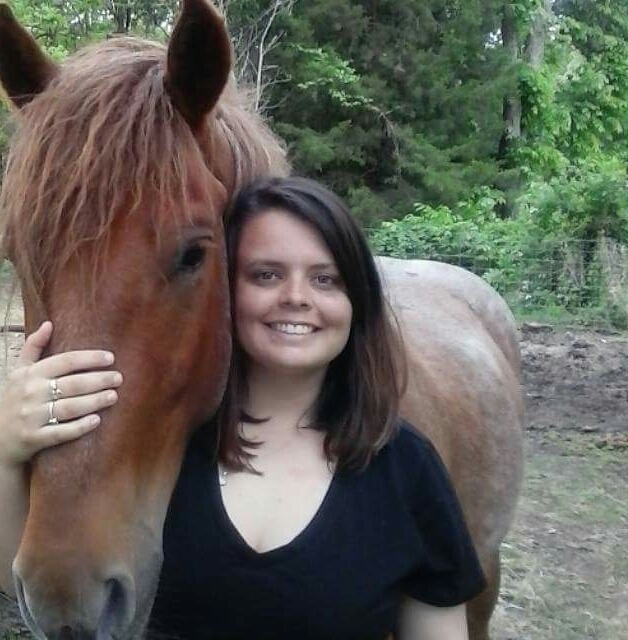 She wasn’t born into a horse family but the horse industry is exactly where she wound up. I started riding at the age of about two, basically when I could hold my head up. My parents are not a horse people. They actually posted a babysitter ad for my sisters prior to my birth. A large family with several teenage children responded and they watched my sisters while my Mom attended night school and my Dad worked. The family that responded owned a large boarding facility in the area. When I was born, the kids went back to school and their Mother took me from the time I was 6 weeks old. I rode around in the gator for chores, helped lead in horses when I was old enough and rode their horses most of my life. I traveled the country in my car seat while their youngest was on the AQHA circuit. I have many pictures of me drinking from a sippy cup in the gooseneck of a horse trailer. I guess you could say this lifestyle started young for me. For the past 3 years, I worked at a 911 dispatch center 40-50 hours per week. I worked nights. Typically my hours were 4pm to 2am but I was often flexed to cover until 4am or 6am. I worked Monday-Wednesday and every other Saturday & Sunday. I volunteered in our Probation Department on my days off. I volunteered usually 8-12 hours per week. Recently, I landed my dream job as the Release Advance Planning Coordinator for the County Jail. I work with inmates who are being released and help them establish a plan to re-enter into the community. I also work on-call in the same 911 dispatch center. I work M-F 8-4:30 and then some weekends or nights with Dispatch. I do take a limited amount of lesson students/horses dependent on time. However, I have committed to my two nieces and one outside lesson student at this time. I give them a lesson 1x per week for about an hour. I currently own one horse. His name is a Crush, a 12-year-old Appendix. I take on project horses and give lessons in my spare time. …my favorite candid shot. It was from Championships this past September. We were walking up to the tunnel for our favorite event. I dunno why I feel so mushy when I see it. Maybe because I didn’t know if he was gonna get to go that year or just that we always seem so in tune with each other. A typical day for me now starts at about 7:00AM (I am still adjusting haha). I usually get up, grab breakfast and head to work. After work, I get home, change and head to the barn. Once I get home, I eat and do household chores and probably get to bed about 11:00pm. I am not much for television or what people call relaxing. I am always on the go. On weekends, you will find me either at a barrel race/horse show or at the barn. On the average week, I ride about 4-5x depending on weather. In the winter, I may go out to the barn and just take him on a walk or just groom if it is too cold. I ride a lesson horse about once per week also. I usually ride each horse for about an hour. Total ride time per week is about 5-6 hours and total barn time is between 10-12 hours. I would say I spend a lot of my time doing flat dressage type work, especially in the winter. I do a lot of ground poles, collection, and topline type work. In the summer, depending on my horse’s needs, I will show him a barrel pattern maybe 1x a week during the season. The rest of my time is basic conditioning and trail riding. In the winter, he doesn’t usually see a barrel pattern. I take him on the trails whenever weather permits. I usually compete about once a week unless going to a weekend long race. Throughout different phases of my life, my schedule has always been very hectic but I have always been a very active, fit person. Even if I was unable to go to the gym, I usually get creative for exercise. It is not uncommon to find me taking me horse on walks or even runs (yes it’s very comical and I don’t have a dog lol). Throughout High School, I was a successful basketball player. So when high school ended and the adult world started I made it a point to exercise. Even when I was a full-time student, full-time employee I spent time at the YMCA. I worked from 8-4:30 and had class at 6:30-10:00 4x per week. I would workout 2-3 days per week in the afternoon gap between work and school. The other days were spent riding or doing homework. This usually meant I packed breakfast, lunch and dinner and ate on the road. I also spent time volunteering at our local arena doing maintenance type clean-up: picking rocks in the arena or the warm-up, painting fences, pulling brush, whatever other odd jobs needed to be done. Recently, I went from working nights to working days. I worked nights for three years and I would usually workout for 45 minutes to an hour after work from 2am to 3am about 3-4x a week. At this current time, I am seeking a new gym as I used to use the one at work in the middle of the night (it’s very busy during the times I can go now). Soon, that will be back in my daily schedule. As a person with a lot of muscle mass I typically focused on cardio and doing multiple sets of reps with low weight. I do have a knee injury from playing basketball so my cardio is typically done on the elliptical versus the treadmill. I did a lot of strengthening exercises and working on my stamina. My biggest obstacles are definitely prioritizing sleep and keeping myself disciplined. Due to the fact that there are so many things I want to do, I have to plan every piece of my day out. I pre-plan meals, lunches, breakfasts, when I go grocery shopping, when I will ride, when I will go workout, etc. I do not have any “tricks” to share about staying healthy aside from don’t kid yourself; something is better than nothing and be realistic. I am aware and conscientiousness of my eating habits. I try not to eat late at night and I try to make decently healthy meals. I cut out a lot of unnecessary foods or additives and have experimented with healthier alternatives. I do not drink pop (unless out for dinner, I admit that’s my treat) which was a hard habit to break. I drink a lot of water and I do not commonly eat out. I find it much easier to control my eating when I make it. Any decision you make in regards to your health has to be long-term, it’s a lifestyle change. I do not get involved with the “get skinny quick” schemes. I am just an active person in general, I do not do well sitting around the house. However, riding definitely motivates me to stay active too and do productive things with my time. I try and compare that if I keep my horse in shape, I need to be fair and keep myself in shape too. Even when I am cooling him out, I usually do it on foot, 20 minutes of walking is a good way to get your body moving. I also enjoy taking him on walks/jogs in the spring/summer/fall months and it’s a great time for us to spend time together. I admit I know more about my horse’s body and workouts than I do about my own but I am learning. I’ve worked with personal trainers and taken what I can away from them but I have a job, real life responsibilities and I have to be realistic about any choices I make. I am a very mentally tough person but I do have insecurities. I haven’t always been treated fairly in regards to my weight but honestly, I think each of those tests have shaped me into who I am now. My thought process has always been to use negativity to make myself better. If something bothers me that someone says, I MUST know why. If it is something I can change, I do just that. But I change it for me, not for them. I like to self-reflect first because usually there is something to be learned about yourself or your surroundings. Physically, yes I am very strong. I am in perfect health and hope to keep it that way. I even went to the doctor a few times and made them test me to see if there’s a reason I am not skinny lol. Unfortunately and I quote they said “you’re one of my healthiest patients.” Darn! 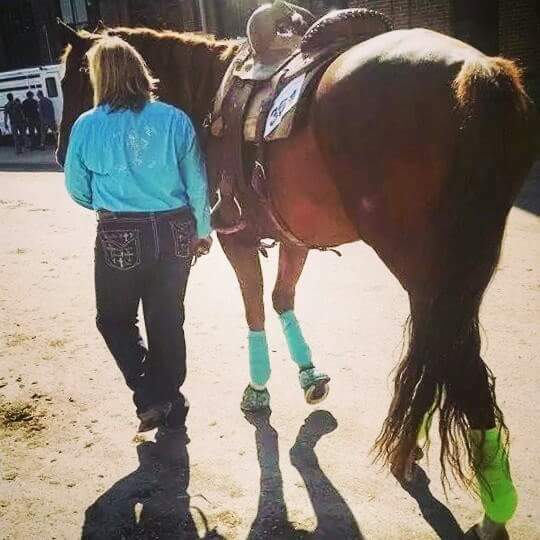 I have been one of the luckiest people I know and have been privileged enough to ride some of the most amazing horses to ever leave hoof prints in an arena. I am proud of having ridden all of them and all of those achievements changed my life. Whether it is winning saddles, qualifying for NBHA worlds, the victory laps at our championship shows, etc. None of them lack importance to me. Even the littlest “wins,” I remember. However, my biggest achievement has definitely been my horse Crush. It’s not a specific win or accomplishment but the whole package. It is personal. Without going into a long, drawn out story, my confidence and love for the sport was diminishing. I almost hung it up after almost 20 years of riding. 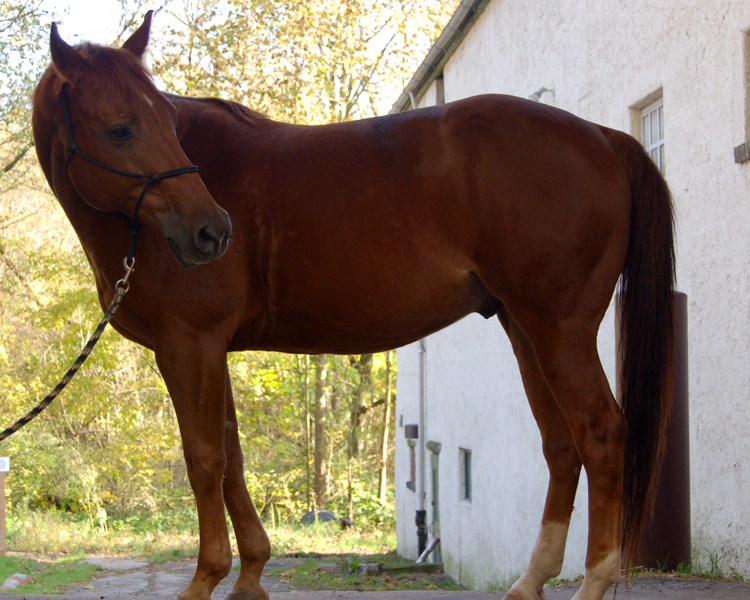 Luckily, Crush… the big 16.2 unbroke late 6-year-old came into my life. He was an eventing “reject” bred for hunt seat. He was $400 dollars and an underdog. He had bad feet, check ligament surgery and was almost seven and hadn’t done anything yet. I always said that I took a chance on him, when honestly; he took a chance on me. Crush not only has overcome some incredible obstacles and beat so many odds himself, he has been my rock. He gave me the confidence and courage I once lost and he’s shown me what can happen when you just love it, pure passion! Crush has done well, we’ve achieved so much together. He’s climbed his way up the latter and clocks consistently in the 2D/3D range against our toughest horses. But I love competing now and I love running barrels again. That is a gift, I can never return to him. My influence in horses has been all over the board. However, the owners of the barn I grew up in have been a huge influence on me. They gave me the tools aka horses to grow on, to learn on and to succeed on. They taught me how to lose but most importantly, taught me how to win. 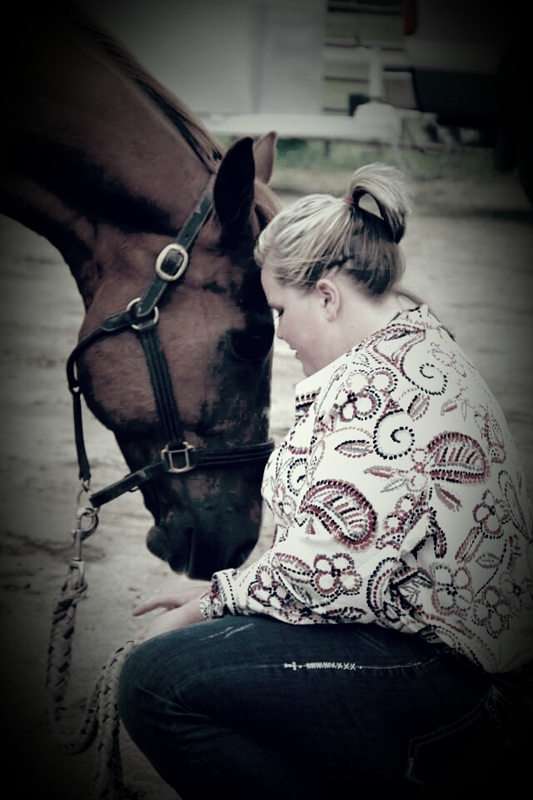 I had the opportunity to ride so many different types of horses… and each one of them made me who I am. So in a way, I guess my horses have all been my biggest influences. However, there are another group of people in my life who believed in me when I didn’t believe in myself. These were people I grew up competing against and when they saw me struggling with my self-belief they reached out and reminded me who I was. They allowed me to be comfortable in my own skin and that no matter what happened in the arena, they were going to stand behind me. They are also responsible reinforcing why I love this sport. These are friends that last forever. Yes, I compete almost every weekend. I have shown in many northern circuits: NBHA, UBRA, NIRA, MBRA, WSCA to name a few. I compete because I love the rush and I love seeing how much progress I can make in a season. I also love the atmosphere and spending time with my friends and my best bud. I always compared horse shows to the mall for your average teenager. I find so much happiness there and when I am not showing, I have no idea what normal people (as in non-horse folks) do on weekends. As negative as some of these comments may be, I use them to fuel my time and energy to better myself. Not by losing weight but by making sure I don’t become someone who feels the need to constantly criticize. But this is definitely one of my biggest challenges; sometimes it is hard not to let hateful words drag you down. There comes a point where you become the best person, rider, friend, coach you can be. Everyone has their scars and their imperfections. Embrace them; you shouldn’t have to defend them. The one thing I would change about the horse industry would be the lack of responsibility people take for their actions. This can be reference their horses or their fellow competitors. Take care of your horses and take care of your friends. No excuses. Since recently I have landed the job of my dreams, my next life goal is to buy that little hobby farm. I would love to get another project of my own and be able to provide my nieces horses to call their own. As far as riding, my goals are to continue to improve and learn. I have been riding a long time but I still love learning new things. I’ve done a little bit of various disciplines but I would love to teach my gelding to drive or even show him in some hunt seat classes. I think its good to be well-rounded. As far as competition, I would love to run at Pendleton one day. That pattern is incredible and I think it is an experience that would last forever. Be kind and be that change you want to see in the world. Reach out instead of walk away. Everyone has a backpack and everyone is carrying something different. Don’t judge them by the weight they carry, literally or figuratively speaking. If you could tell the world something about yourself that you think goes un-noticed what would it be? Just that those who’ve pushed me, made me better. So Thank You! Denise is a lovely cowgirl that I think a lot of us can relate to. In previous years, she barrel raced more but with the demands of work and family, it’s hard to juggle a schedule and get it all in. The desire to ride is still there though. 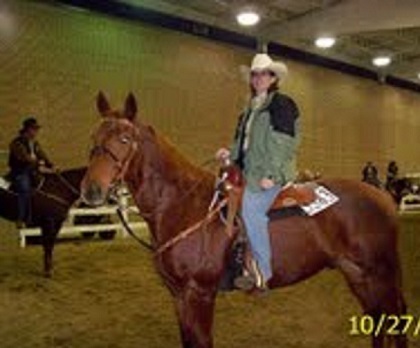 2007 and my favorite horse memory- getting to compete at QH Congress. That was also a great riding weight for me. I have been raised around horses. 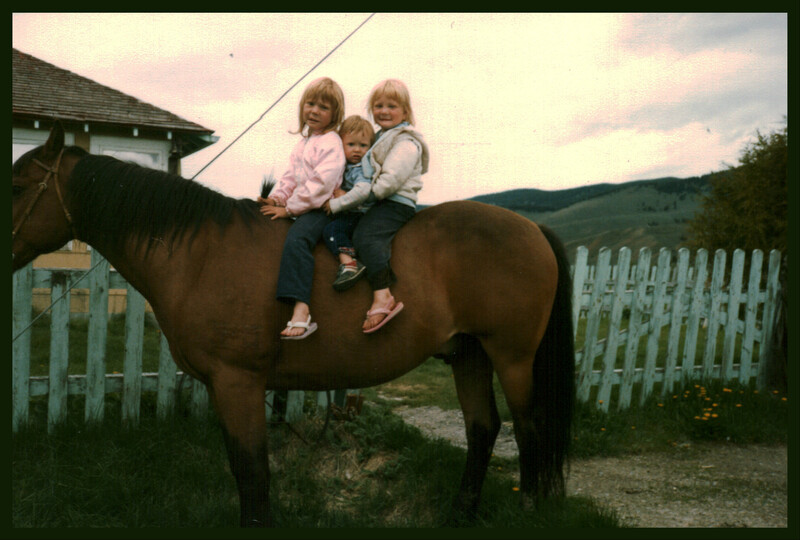 First sat on a pony’s back when I was 2 months old, however, my aunt/uncle owned the horses. I rode whenever I visited. When I was 8, my mom got the horses because my aunt left for the army and my uncle left for college. That is when it really took off for me. We spent HOURS and HOURS in the saddle. It was nothing to ride almost all day at times. I work as a case manger with developmentally disabled adults in a day programming setting. 2 horses and 2 ponies. Hard to answer how many times I ride anymore. A lot less – I’m lucky to get in once a week in the warm months. My daughter rides her barrel horse regularly and the other horse is unusable due to medical issues. I rode the one pony some this summer but was not fun for me. Hoping to sell the two ponies this spring and get a horse for trail riding. If NO kid’s activities…I get up around 6:30 a.m., head to work, work 8-4. Then I go to gym (only as of the first part of February), run any errands while out, and then I like to get barn work done as SOON as I get home, dinner hopefully before 7:00. Then I have some computer or TV time on some nights and then it’s bed between 10-11. If there is dance or games, I don’t stop after work at all and who knows when we walk through the door at night (of course dinner is the closest drive through). The weekends vary greatly from non-stop to the rare but treasured down day. No schedule at all. I rarely ever ride from late November – end of February. I’m a weekend rider during the summer. I like a 2-3 hour trail ride. On occasion, I get to ride Sat & Sun but this past summer was usually one day for different reasons. 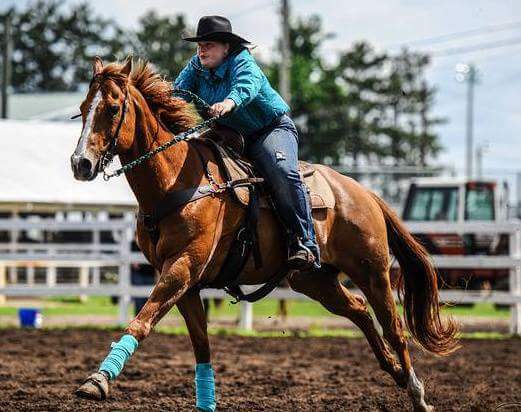 I try to make sure my daughter and her horse get in more time by going to the local arenas to work, going to work with a great, young knowledgeable lady, and horse camp. Just started going to the gym two days ago (Feb. 2). Did good the first two days! LOL! I am going with a good friend who is determined to keep my motivated and moving. My biggest issues will be kid’s activities, and my husband’s work schedule. Not for the past two years and not much motivation after my daughter took over my “suppose to be come-back barrel horse.” However, horses are what has motivated me to start to the gym this time. I really want to ride this summer with the family but I know I need to lose the weight and hopefully regain some of my confidence again. When I lost about 25lbs about 5 years ago, I did not cut anything from my diet. I did not “forbid” myself any foods, just better portions, less snacking and no eating after 6 pm. I did no gym that time, but got moving a LOT more around the farm and home. Plan to stick to the no limits on foods just smarter eating!!!! Physically- NO, major out of shape. Mentally- overall “yes” about most daily life. God is my rock and strength when dealing with issues, and helps me to prioritize what is important and what is not. 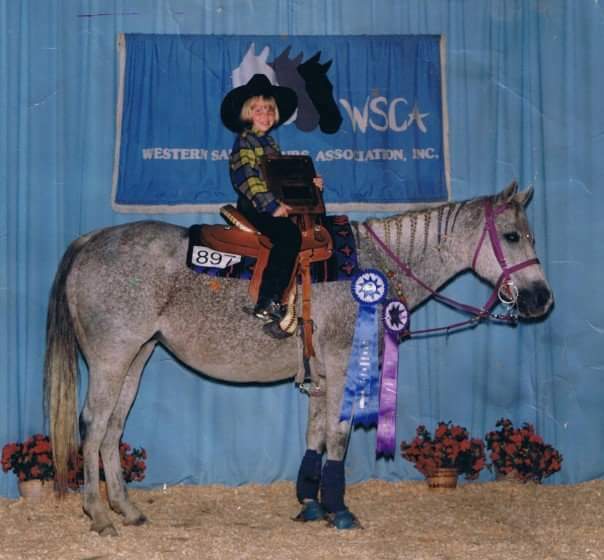 In 2007, myself and friends competed at QH Congress in the Amateur barrels and I held my own. I did not win, but was not blown out of the arena either. LOVED the experience! 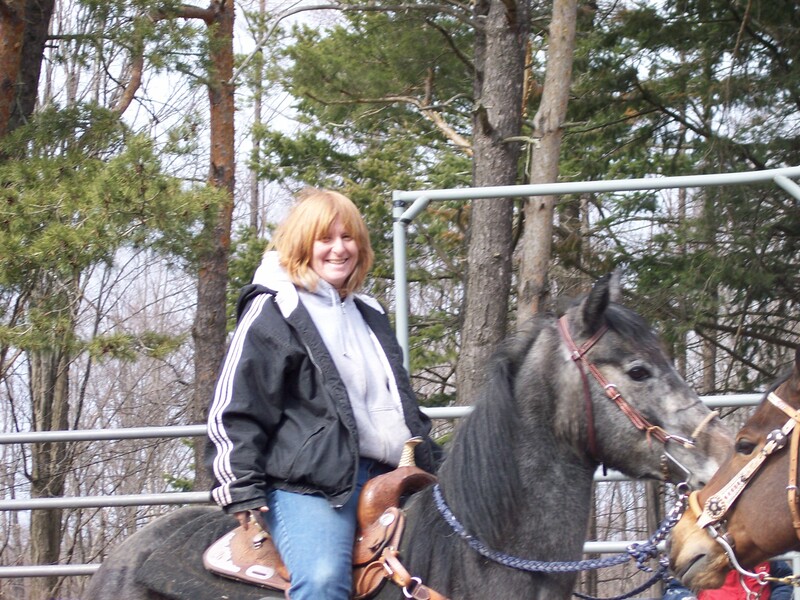 Also, several years ago, I rode a nice mare for a good friend. During a run, her bridle broke and we still pulled 2nd in the 2nd division at a larger show. Won several high points, at varies local jackpots, with my childhood horse (I so loved that little horse and those wins mean the world to me still to this day). I idealized Martha Josey when I was growing up. My biggest influence though has been my mom, who encouraged my riding growing-up and worked VERY HARD so we could keep the horses during my father’s illness. I also have a good friend now that keeps encouraging me not to give up on my love for riding. 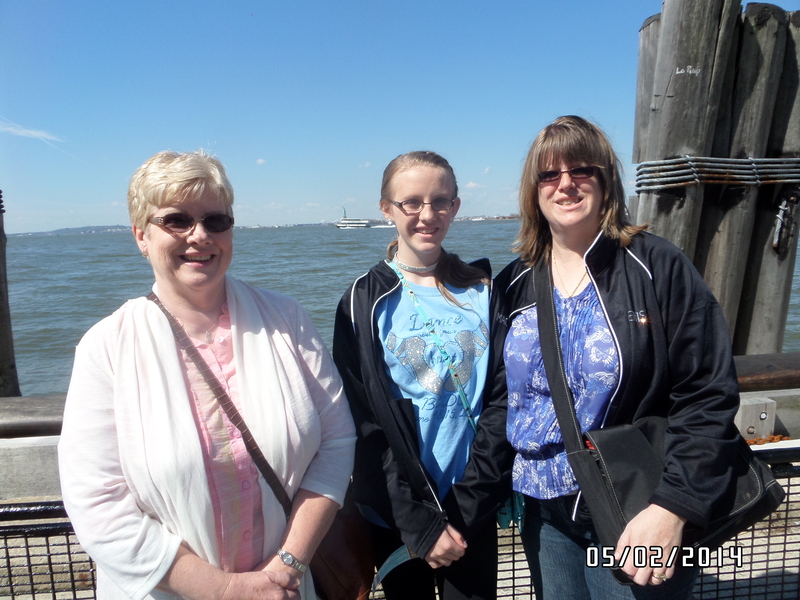 Me, my mom and my daughter. We still love to ride together. My mom is 64 and just got a new horse this summer that she loves. Not in the last two years. I don’t have a horse to compete on (“My daughter took my horse” has become the joking truth around our house). Overall, though I have lost so much confidence. My overall confidence. It has slowly left me and it is hard to get back. Riding was always fun and relaxing for me, it came naturally – not anymore, sadly. I HATE the thought pattern that only people who own “high dollar” horses/money must be great overall horsemen & riders, and just because someone is a “back-yard” or “jackpot” rider they are less knowledgeable or talented. I know this is NOT the mind-set of all, but there are many. I personally know some very knowledgeable horse owners that have no desire to compete or own high-end horses; they simply enjoy being out on the trails and the companionship of their horses. Just because one has money, it does not make them the best at something and I think that is the mind-set of the world in general. At this stage in my life, I want to find a good companion horse and start enjoying riding again! I don’t have to compete but I want to spend the day riding with my daughter and mother (we still all ride together when we can). I realize my weight is a huge obstacle to my confidence in the saddle. I started the gym the first of February and I hope to get a nice trail horse this spring but my budget is limited. 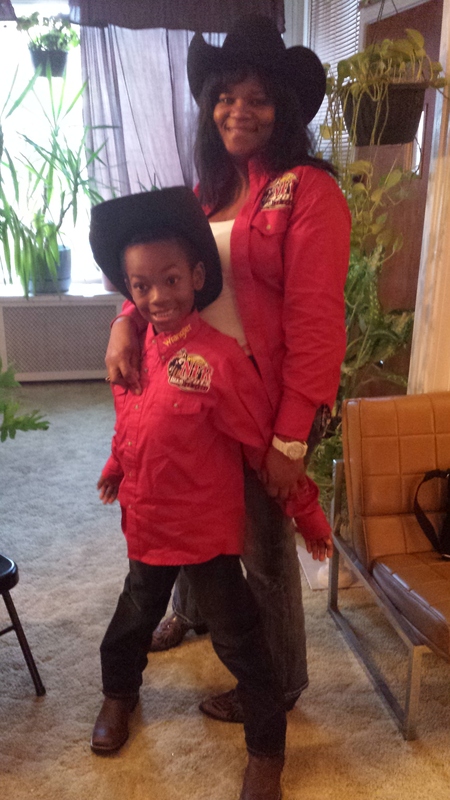 I am really enjoying being a rodeo/ horse show mom and I hope my daughter can take it steps further than I ever did. My heart is screaming “I want to ride” but my mind is holding me back. I don’t know about the whole horse world but I REALLY would like to get my daughter to understand that I do know a thing or two about horses and barrel racing. Very frustrating, so at this point I just pay someone to help her. It saves my sanity. LOL! I would love to hear the words “you are beautiful” (referring to my physical appearance). I am blessed to get kind words about my personality which I KNOW is the most important but deep down every woman wants to be beautiful inside and out. 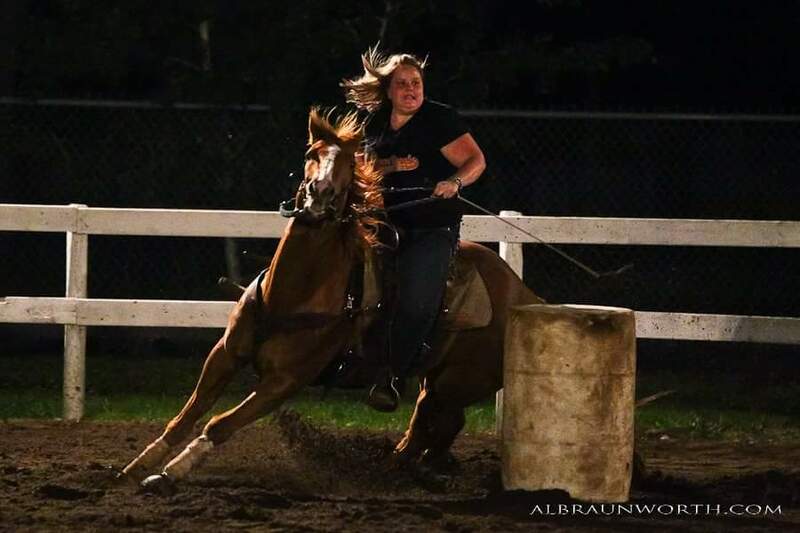 Leslie is a New Jersey cowgirl that is passionate about barrel racing. 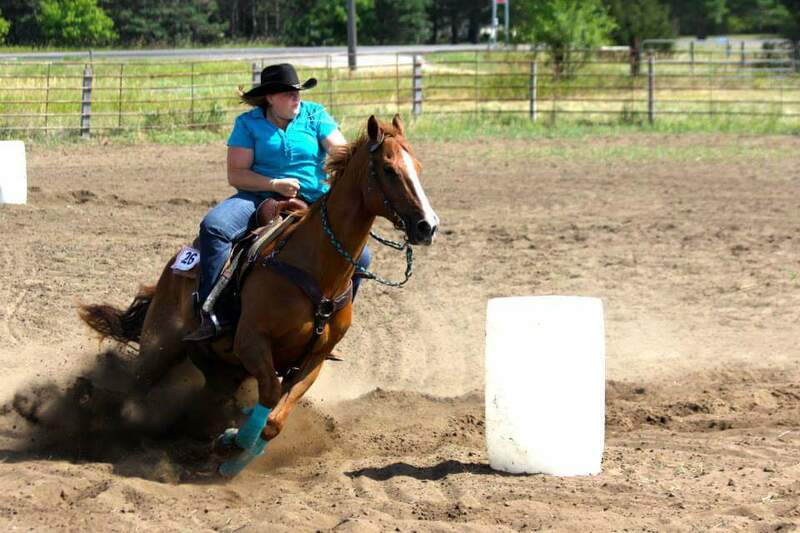 Although her time is stretched thin, she does what she can to keep working towards her goals of being a better rider. I think you’ll find some inspiration in her no-nonsense approach! How did you get start riding? I got my first pony when I was 3 or 4 but when my parents divorced (I was 5) my dad had to sell the horses. I didn’t get another horse until I was 14 and have had one ever since. At the time my grandmother said it was a phase I was going thru! I am a state employee. I have a customer service job for Taxation. I work 7 hours a day, 5 days a week. I own two – I only ride the one I currently compete on. 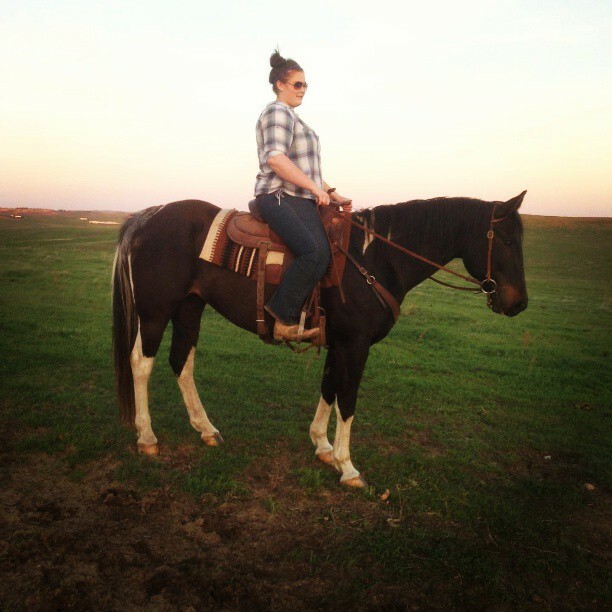 Prior to getting this horse (July 2014), I rode my now retired 22 yr old gelding and a trail gelding. But, it’s too hard keeping two horses fit, working full-time, and boarding 35 min from home and an hour from work. This is Banner, the horse I just got last summer. I am hoping for many years with this horse. This pic I really feel like I am really enjoying my horse and he is wanting to get down and work. Winter I don’t ride much at all unless we are having a mild one. The rest of the year, I try to get out to the barn both days on the weekends,and twice during the week. Weekdays I go right to the farm after work, which puts me there about 5pm, depending on traffic. How many hours I ride depends on if I am trail riding off the property or staying on farm just to do arena work. Trail rides are normally 2-3 hours, on farm I would say one hour tops unless I am having a lesson then it could go longer. Most of my time is spent conditioning and training because I don’t have trails that are easily accessible where I board. If I am trail riding it will most likely be on a weekend when I don’t have time constraints because I have to trailer off farm. At the moment I am taking a fitness class two times a week (2 hours per week). It is helping me get thru the winter and hopefully I will get fitter and maybe lose some weight. Once the time changes I probably will not take another fitness class because I will spend most of my time at the barn, riding and doing barn work and that is my exercise. My biggest challenge is finding the motivation to do anything in the winter! I am planning on taking Yoga classes to help with flexibility and core strength. This is Chic. 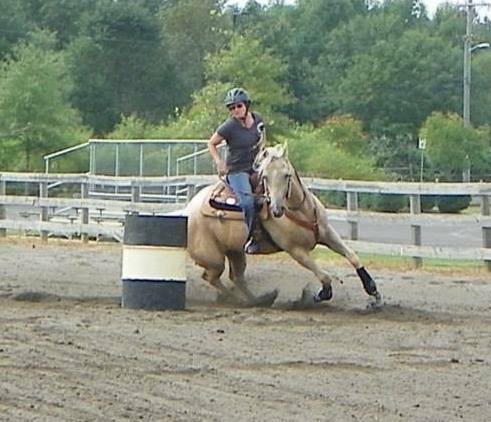 I only ran this mare for about a year and half (she had many soundness issues) I loved this mare and was just starting to clock in the 1D when I had to retire her. It broke my heart. A lot of hopes and dreams were lost when I had to quit running her. I love this pic of her. I was a little thinner in this pic. I can’t fit in that shirt anymore!! This summer I started to cut way back on processed foods and I feel so much better. I haven’t really lost any weight, but my problem is I need to stop eating sugar and watch my portions. I was actually doing really well before Christmas……and then that went down the tubes! Riding and my horses are pretty much my motivation for living (sadly!) but I just don’t have the will power like I did when I was younger. If I want it, I want it. NO, not at all! Couple of reasons… I tore an abdominal muscle probably ten years ago and had to stop doing the normal horse owner things. I am now able to do most of those but still have to be careful. Also, I went to full board almost three years ago (always did self-care) so I don’t get the daily work associated with that. Because of that, I gained weight (size 12). Menopause doesn’t help that either. My dad. He is the one that gave me the horse bug. Yes I do, I barrel race. I absolutely love it! It is an addiction for sure. It is such a feeling of accomplishment when it starts coming together after working so hard on something. I am truly at my happiest at that moment. Trying to ride quietly. This goes back to having a weak core. Meet Lorie. She has been through some extremely tragic events in her life that have made a huge impact in her life, and in her confidence. Even so, her spirit is not completely broken. In her own way, she’s finding her path the person she wants to be. I started at a young age maybe 7-8. My neighbor had a boarding stable. with a ton over overtime. I can only afford one, lol! On days I work, I take kids to school and then 12 hour shifts. Then I come home and to try to clean or cook for next day. doesn’t need to work on anything. I like to walk with my mom (2 miles), or go to the gym for around 45 minutes of cardio and weights. I don’t at this point. I would like to get off fast food. With my 12 hour shifts, being a single mom, and having a very stressful job I eat horrible. I’m an emotional eater. My main goal and struggle is my eating. When I’m on my good patch I do feel strong. Winning a saddle couple years ago. Any time I come out of the arena on my horse I feel successful, lol! David Lawson (trainer I ride with). He is always positive. Yes, I run barrels – not as much as I would like. I tend to let my mind get the best of me and hate riding in front of people some times. I also can’t afford to go as much as I would like to. If you could change one thing about the horse industry, what would it be? People in general. Just cause your 1D doesn’t make you a better person than us 3-4D riders! My life goals is to be a happy person. My riding goals are to lose weight and be competitive with my horse. She has run in 1D with my daughter. To get to that point I plan on going to gym and eating better. Mentally, I just feel like it’s a useless point. Horses should be more than just a tool they should be like your children. Just because I’m over weight doesn’t mean I don’t have feelings. 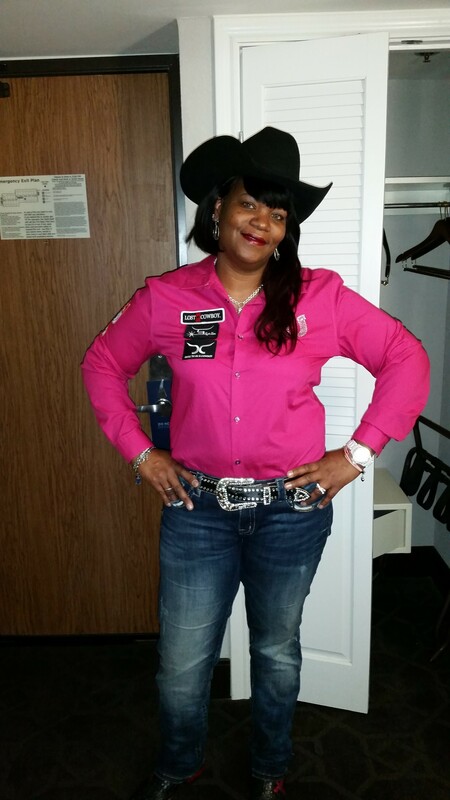 Meet this terrific cowgirl from North Dakota. She’s working her way through school, which is very admirable in my book! 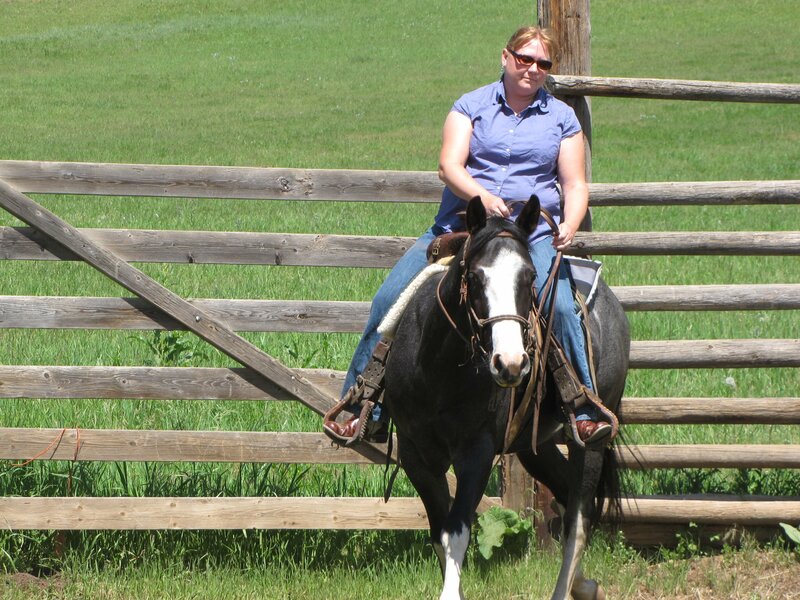 I think to be a real cowgirl you must have a good work ethic and Kendra definitely has that! I don’t remember a time that I wasn’t obsessed with horses. I distinctly remember getting a big plastic horse on springs for Christmas when I was two. I rode that thing constantly and loved to make “bridles” for it. My parents let me start taking riding lessons when I was six and I have never stopped. I go to college part-time now for Computer Information Systems, but I also work as a dispatcher for power companies. How many days I work per week varies from 2 to 7, but it’s usually 12-hour shifts. My first time shooting off Cash. I just sold one so I’m down to two. I ride one and my sister rides the other. I typically work evenings, so I get up late morning, work on schoolwork and do errands, go out to the barn (I board my horses), then head to work. On the evenings I have off I give my younger sister riding lessons. My horse is coming off an injury, but typically, I ride between 3 and 6 days a week. It depends a lot on the weather and how much I’m working that week. My horse is very well-trained and quiet, so most of the time we just do conditioning work. I am teaching him mounted shooting though so we incorporate at least one shooting practice a week. Once or twice a week when the weather is good I like to get out on the trail. Aside from riding, I simply do not have much time to exercise. I take my dogs for a few walks every day and I try to do yoga and work on the machines at the gym, but that is sporadic. I hope that after school I can devote more time to getting in shape. I feel like I owe it to my horse to be as healthy (and light) as possible. He works hard for me so I want to make our rides enjoyable for both of us. Besides that, I want to look good and feel good! I notice when I have a bad week or whatever, it’s hard to muster the energy to ride and work at the barn. I try to eat lots of fruits, veggies, lean proteins, etc. Physically? Yes. I’ve always been stronger than many of my friends. For one, I’m nearly six-foot tall so I just have a larger, sturdier frame than most people. Add to that the fact that I’m always working with horses, lifting heavy objects, and so on, I’m pretty strong. Mentally, I’m strong too. I’ve been though a lot in my life. My family moved around quite a bit while I was in high school. My mom had breast cancer and a few years ago, when the economy was at its worst, my father went to Afghanistan to find work. 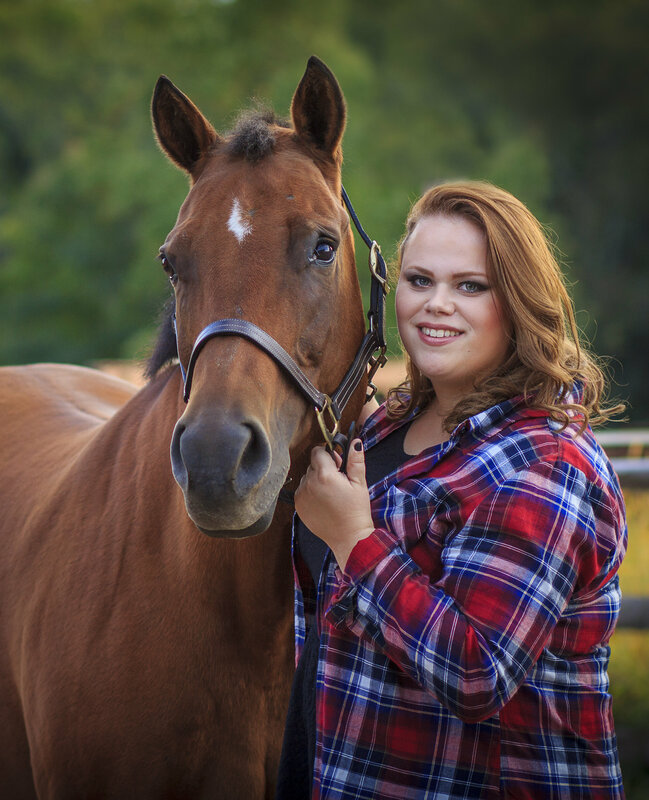 I worked all through high school and paid for my riding lessons, and have always been completely responsible for my horses. I have no impressive show record or anything like that but I’m proud of how far I’ve come in my riding. I started riding with an amazing grand prix dressage trainer a few years ago and improved my equitation exponentially. This has given me the confidence to push myself to try new things as well as start giving lessons to my sister. There are so many equestrians that I look up to from all disciplines. I look up to Sherry Cervi, Catherine Haddad Staller, and George Morris for their skill in their respective disciplines. You can learn something just by watching them. 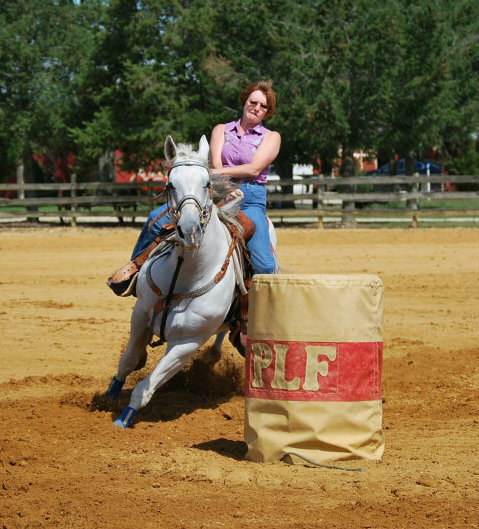 Kenda Lenseigne has also been an influence, as her success in Mounted Shooting is what initially sparked my interest in it. I have only done one show in my life. It was a small schooling show but I did win all four classes I entered so it was a good first time. I’m extremely excited to start competing in Mounted Shooting with my new gelding this year though. My size is a challenge. I’m just not aerodynamic and agile like some smaller riders, so have to work harder to be competitive. The hardest thing by far though is keeping my confidence up. I spent some time riding horses that just tore my confidence down. Taking lessons from a great trainer and purchasing my current horse, who is a quiet and reliable confidence builder has helped a ton. I hate when the welfare of the horse is not the first priority. It disgusts me how some people can take advantage of the good nature of these creatures for the sake of money or a ribbon. Drugging, poor training practices, neglect, and lack of knowledge are all damaging to horses and the industry as a whole. 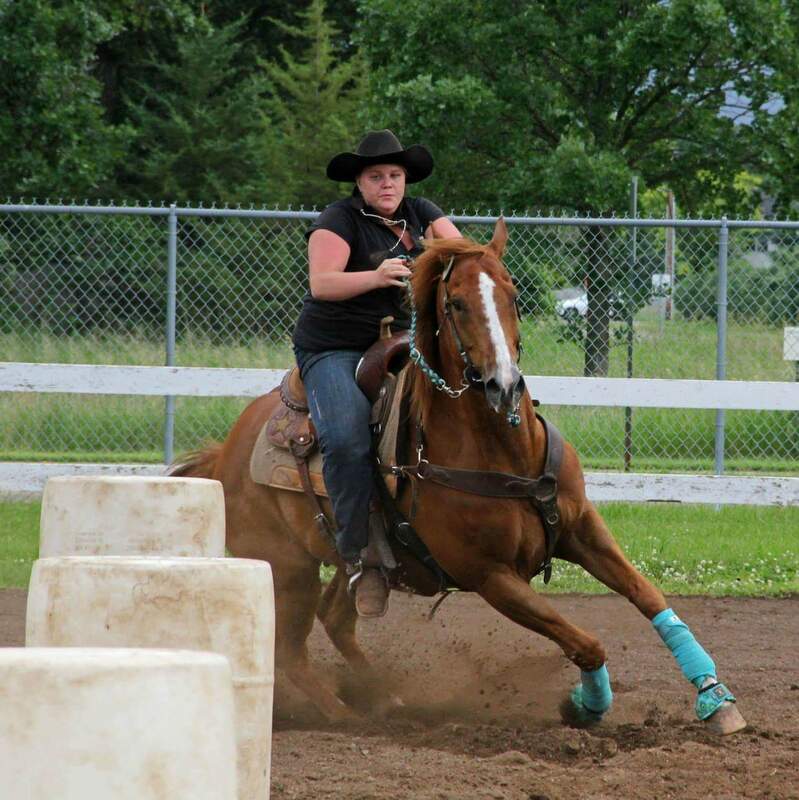 My riding goal is to compete and win in mounted shooting, going as far up the levels as my horse and I are capable of. I also want to continue to improve my equitation and training skills. My main life goals are to get into better shape and lose some weight, get married, and find a job that I enjoy that supports my horsey habit. Be open-minded and never stop learning. Try a new discipline, ride a horse that pushes you, take lessons, read books, keep on expanding. There’s not much about me that doesn’t go unnoticed! I tend to stand out (which can be good and bad) and once you get to know me I’m talkative and a total open book. I’d have to say if anything goes unnoticed it’s how sensitive in nature I truly am. I pick up on a lot of things others don’t, and I think that’s part of why I do well with horses.